When I traveled to San Francisco for the first time I was fortunate enough to have a few friends that live in the area that recommended many things to do. 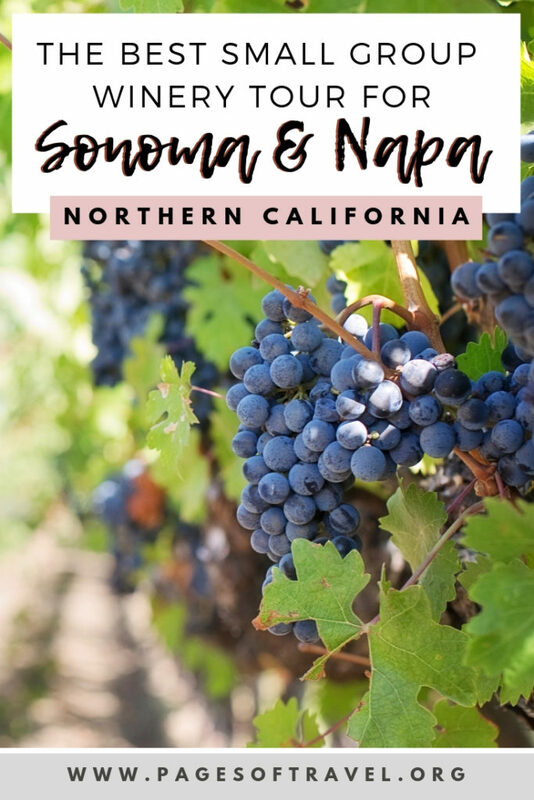 But since my mom and I wanted to find a tour to go on that would give us a better feel for the city and others that were wine country and culinary specific. 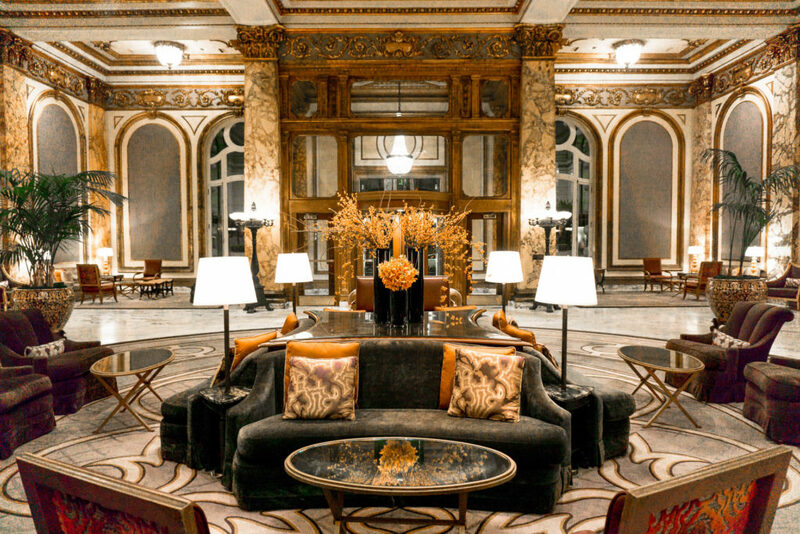 These tours from San Francisco are perfect for those who are planning to spend a few days in San Francisco and would like to experience a unique side to Northern California. Disclaimer: This post includes affiliate links which we may make a small commission from. As always we only recommend places and products we love, all opinions are our own. 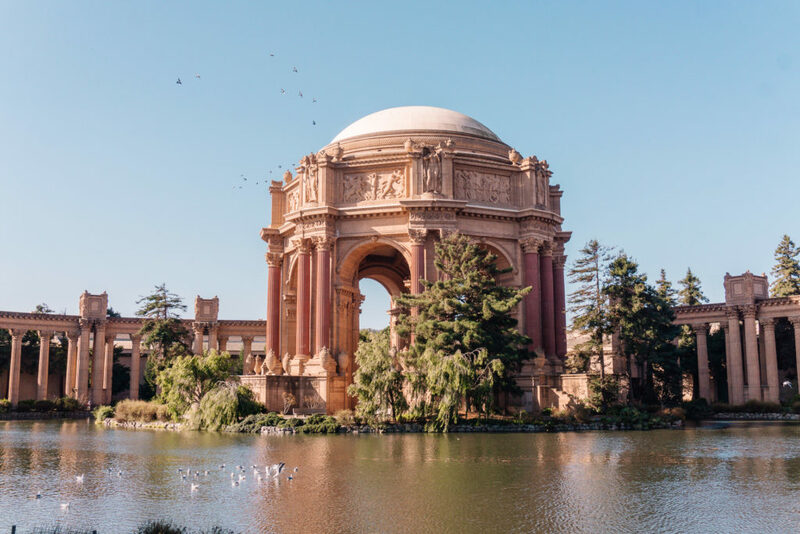 The first tour from San Francisco I want to recommend is a San Francisco bus tour, but it’s not the kind you’re probably thinking of! It’s actually a small group tour in an old school VW bus, not only can you see out of any seat with the extra large VW bus windows, a smaller tour gives you the luxury of going places larger tour buses cannot. 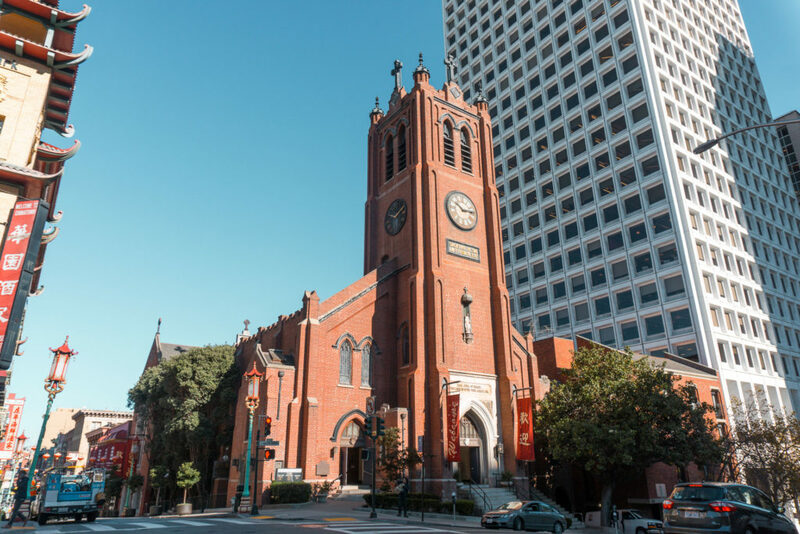 I recommend going on this tour for your first day in San Francisco if you can because it will take you around to all of the major sites and neighborhoods. Our guide, Chad, was extremely fun and knowledgeable of the history of specific places which we might not have otherwise known. He also recommended many places to eat, shop, and see, which will help you get an idea for areas that you want to return to! On the VW Bus Tour we first drove through Union Square which is a popular shopping area in San Francisco followed by Chinatown (more on Chinatown later! ), and North Beach, a neighborhood with rich Italian heritage and for obvious reasons, home to some of the best Italian food in San Francisco. 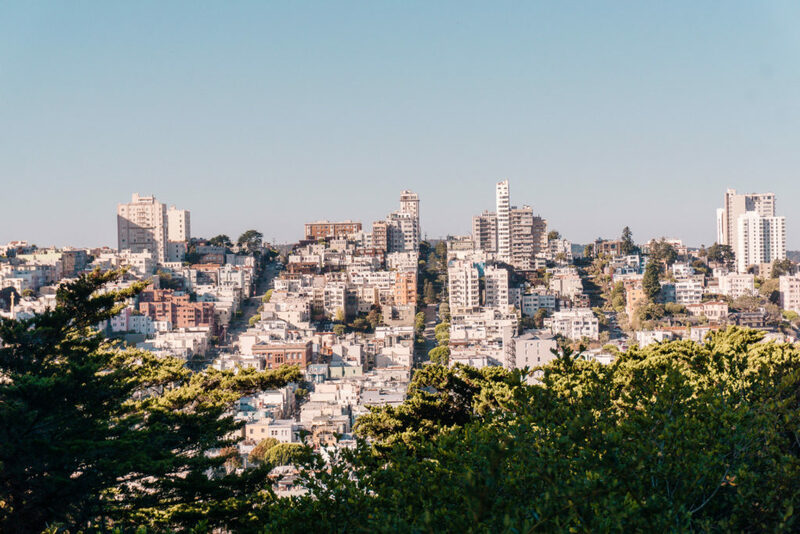 Next to the North Beach area is a short hike up Telegraph Hill where we stopped to see Coit Tower and a panoramic view of the city. 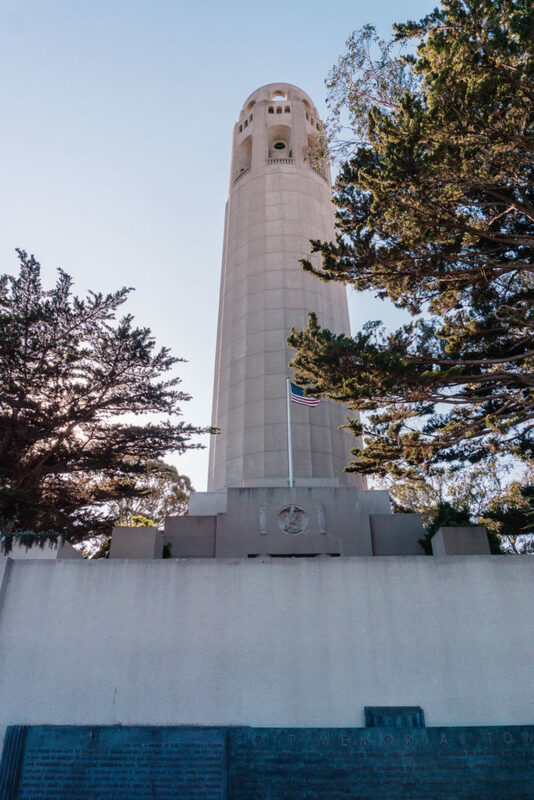 Coit Tower is an important monument in San Francisco and is a dedication to the volunteer firemen who died in San Francisco’s five major fires. Coit Tower was paid for by the estate of the late Lillie Hitchcock Coit (1843-1929), a wealthy socialite who had a special relationship with the cities firefighters. Coit even fought fires herself starting at age 15 and became the first honorary San Francisco firefighter! She wasn’t a typical lady for her time (and for that I love her). She was often seen smoking cigars, gambling, and wearing trousers long before it was “acceptable” for women to do so. Next, we ventured over to the Palace of Fine Arts which was originally the sight of the 1915 Panama-Pacific Exhibition. The original buildings and models for the exhibition were built out of wood, plaster, and burlap but were rebuilt and serves as an admired wedding and photography spot in San Francisco. Of course, no San Francisco bus tour would be complete without visiting a scenic viewing spot of the Golden Gate Bridge. There are a number of places you can get a great view of the Golden Gate Bridge but the place you’ll stop on this tour is Fort Point. I think our bus made for a fun picture too! After visiting the Golden Gate Bridge on our San Francisco bus tour we drove over to Golden Gate Park which is the largest man-made park in the United States at 1,017 acres. To put it into perspective it is 20% larger than Central Park in New York City! Inside the park are the Japanese Tea Gardens, the Academy of Sciences, the San Francisco Botanical Garden, and many other attractions, museums, gardens, and statues. We didn’t have enough time to visit this area again after our tour but it’s definitely somewhere we want to check out more when we return to San Francisco. For another great view, we drove up Twin Peaks, which are two high hills towards the center of the city. We pulled over and took some photos of the San Francisco city skyline. 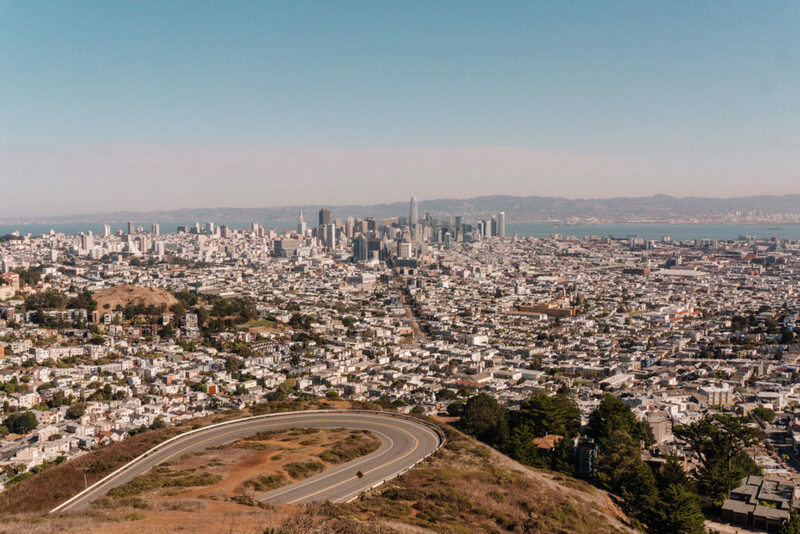 We were blown away (literally and figuratively) by the views from Twin Peaks! Haight-Ashbury was our next destination which felt like a step back to the 1960s with all the funky thrift shops and record stores like Amoeba Records. I can only imagine how cool it was in its prime. Haight-Ashbury was the spot for the 1967 Summer of Love, a social phenomenon consisting mainly of young people, many who were highly suspicious of the government and opposed the Vietnam War. Others were more interested in art or spiritual and meditative practices. Psychedelic Rock Music had entered the scene and many famous musicians lived close to each other like the Grateful Dead and Janis Joplin – don’t worry you’ll get to see their old digs too! 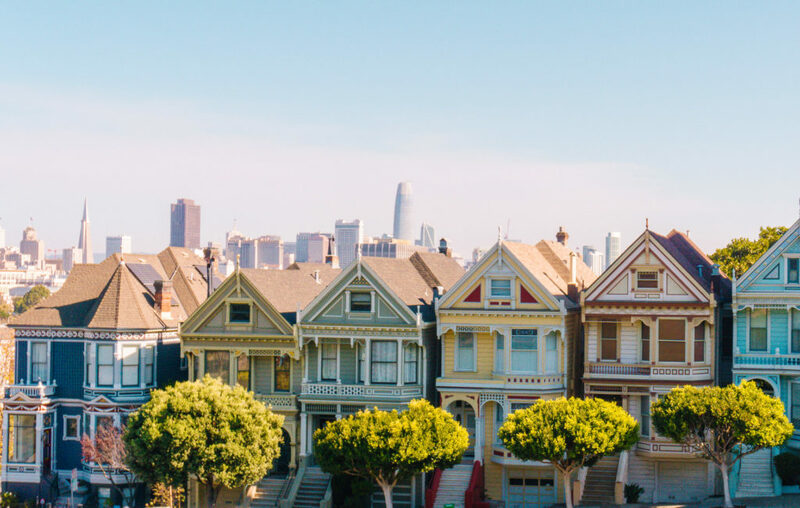 The last stop on our tour was at Alamo Square to see the Painted Ladies which you might recognize from the opening credits of the TV series Full House. The colorful Victorian and Edwardian style houses on this street were built between 1892-1896. Originally there were over 48,000 of these homes in San Francisco but in the aftermath of the 1906 San Francisco earthquake, most were destroyed and replaced by more modest homes. As I said, this tour would be perfect to enjoy on your first day in San Francisco, especially if you are a first time visitor. It takes you to all of the major highlights in San Francisco which allowed us to figure out what areas we wanted to see more of! Another one of the tours from San Francisco that we opted to go on was a San Francisco wine tour to Sonoma and Napa. 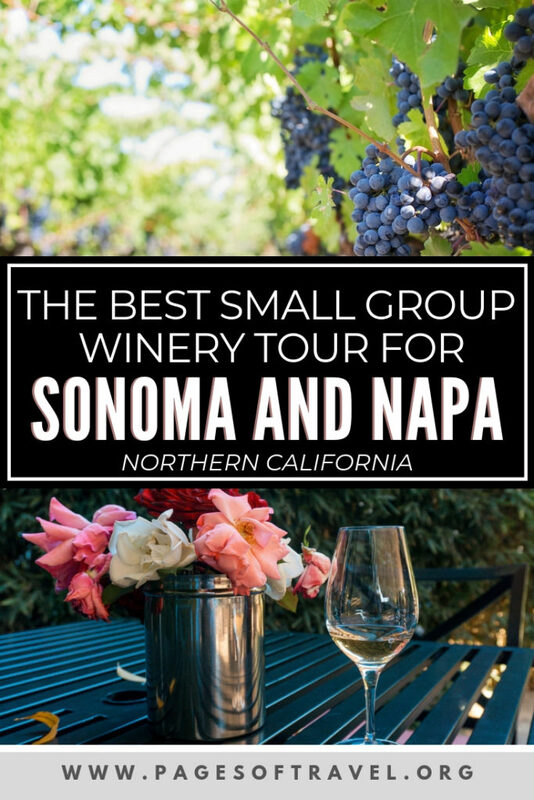 Be aware that this tour is a full day (8:00am-6:00pm) but it is entirely worth it if you want to visit a few different wineries in Sonoma and Napa Valley. First we went on a short tour through the city by Lombard Street, Palace of Fine Arts, and enjoyed a view of Alcatraz and Angel Island. 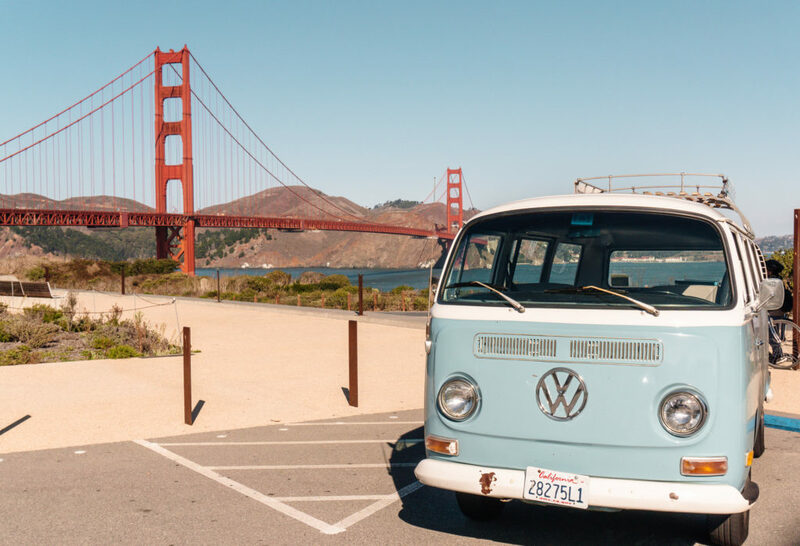 You won’t stop at any of these locations but if you did the VW Bus Tour of San Francisco you shouldn’t need too or you can go on your own later! 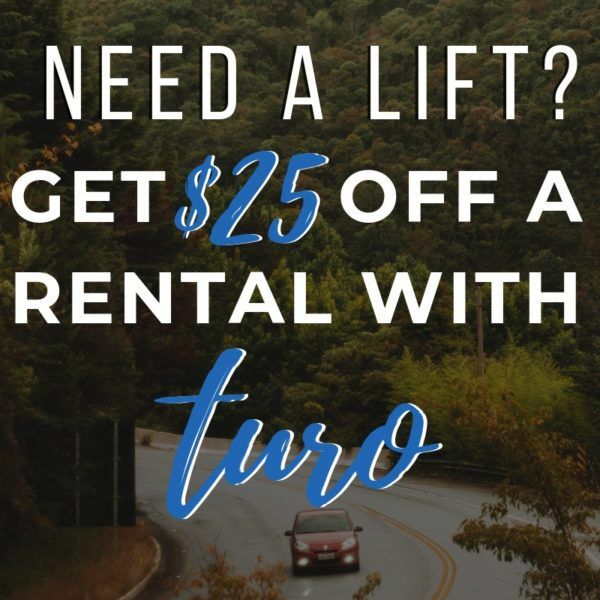 As an added bonus, this tour will take you to Muir Woods National Monument where you can see the stunning Redwood Trees that stand 280+ feet tall! 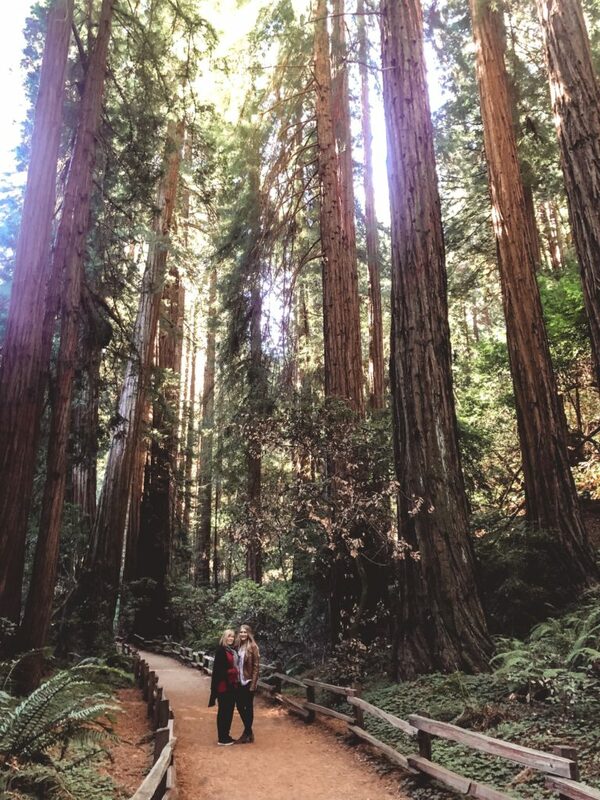 When we arrived we had a little over an hour to explore Muir Woods, which allowed us to enjoy a few of the main trails including Cathedral Grove and Bohemian Grove along the Redwood Creek. The beauty here is unexplainable – honestly photos can’t do it justice considering just how tall these trees are! On our way back to the bus we grabbed a coffee and snack at the gift shop up front before continuing on to our winery tour. Keep in mind that because this area is shady, cooler temperatures are common. I suggest bringing a light jacket or sweatshirt for this part of the tour. After visiting Muir Woods we headed to our first winery, Mayo which is located in Sonoma. It was the smallest winery on our tour only producing 5,000 cases of wine each year, but we loved how charming this family owned and operated winery was. Unfortunately, at this time, they do not distribute their wine because they are so small, but that just means you have to stock up when you go! 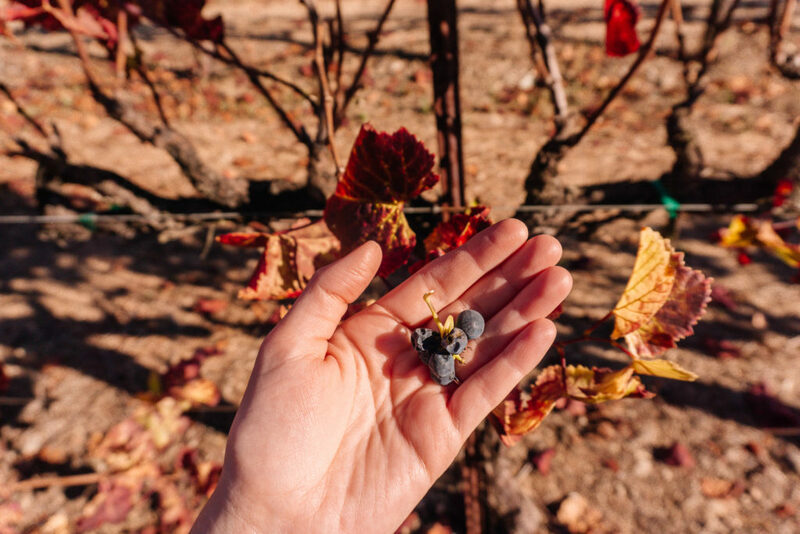 At Mayo, we had a short tour of the winemaking process and grape harvesting – obviously, I won’t spoil the tour for you but one interesting fact that stuck out was the cost of wine barrels. We learned that wine barrels are $1,500-$2,000 a piece and are only used 3-5 times before having to be recycled. Take about a hefty investment for such a short span of use! 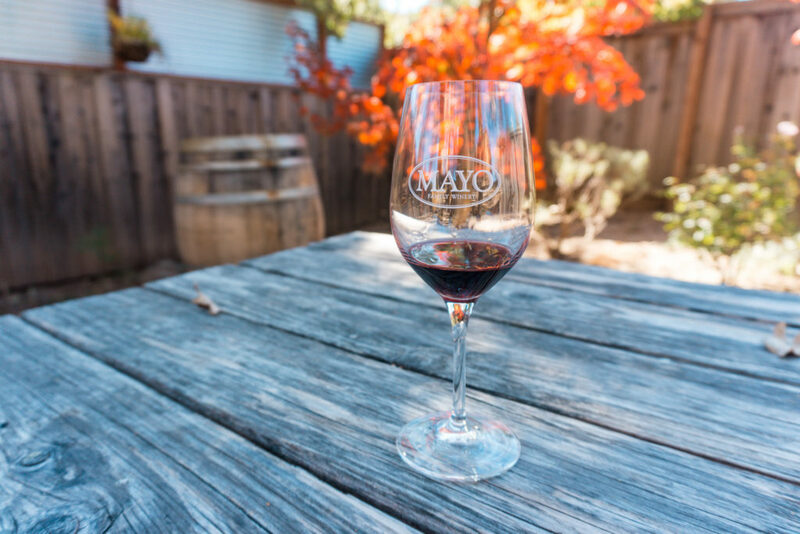 The wines at Mayo were a Chardonnay which was made in neutral oak barrels and tasted just like a chardonnay grape picked right off the vine, a Zinfandel, and a red blend called Mayhem. Out of the three Mayhem was a favorite at Mayo (and my favorite on the tour!). If you want to try other wines at Mayo they will let you try an additional three including any of their white, red, or dessert wines. After visiting Mayo we stopped for lunch at Sonoma Plaza. Our tour had the option of adding on a course meal at a restaurant there but we opted to find our own place and chose to dine at Sunflower Cafe. I cannot get over how awesome the outdoor setting was of this cafe and the food was excellent as well. We each ordered sandwiches, a gourmet grilled cheese and turkey pesto which came with side salads. I suggest adding one of their blackberry mimosas too! After eating lunch we walked around to some of the other stores in Sonoma Plaza (they have some super cute decor and cheese stores!) and grabbed ice cream from Sweet Scoopsbefore heading back to the bus. The second winery we visited was Kieu Hoang in Napa where they served three different wines a Chardonnay, Red Blend, and Cabernet Sauvignon. We were also able to go through the vineyards and pick a wine grape to taste. They might have been little, but they were sweet and juicy! Out of all the wineries we visited, this one had the best outdoor seating area – we honestly wanted to stay and relax here for a few hours but there were more tastings to be had. 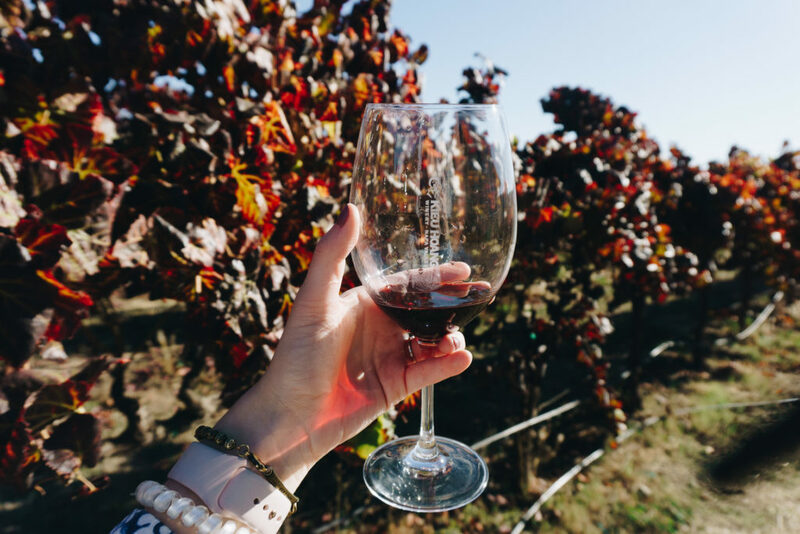 The last winery we went to was Cline Cellars in Sonoma, another family owned and operated winery which specializes in Zinfandels and French Rhône-style wines. 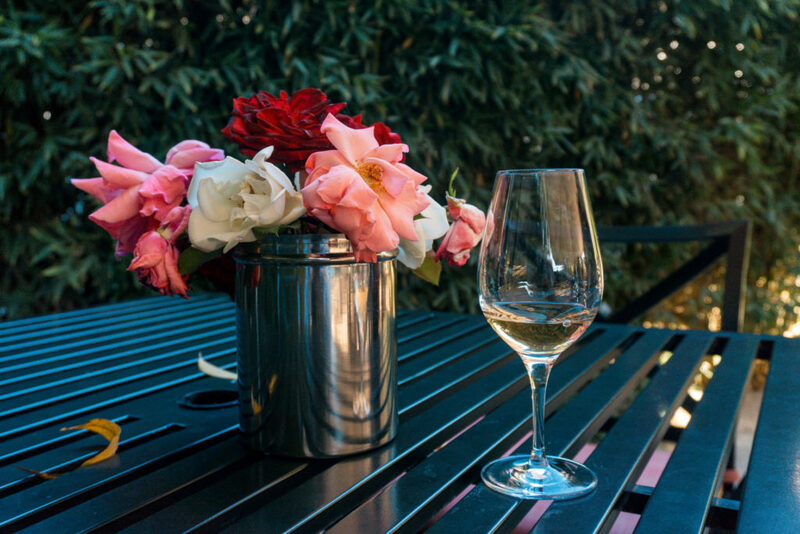 Cline Cellars offered tastings 5 different wines in one of their outdoor seating areas, and let me tell you – each pour was generous! The wines that were selected were Pinot Gris, Chardonnay, Rosé, a Red Blend called Cashmere Black, and a Heritage Zinfandel. Cline also had a nice gift shop and large tasting room inside. 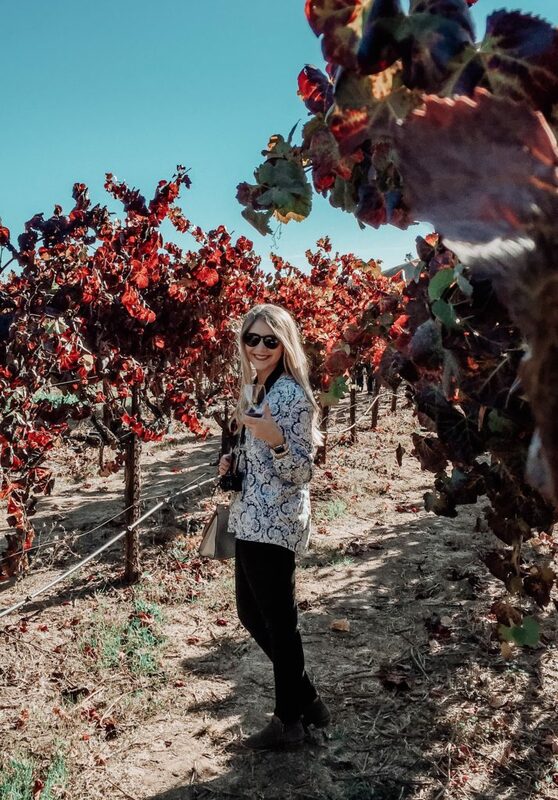 What I loved most about this tour was the ability to try wines at many different locations, learn about the history of each winery, and experience the different environments of each. Out of the three we visited, I liked the wine at Mayo the best, my favorite environment was at Kieu Hoang, and Cline Cellars had a mixture of great environment and I also enjoyed that there were more types of wines here than others. On the way back to San Francisco we stopped to enjoy a view of the Golden Gate Bridge at sunset which I believe is probably the most magical time to see the bridge due to the colors of the sky and lighting (I can bet that sunrise is also like this!). 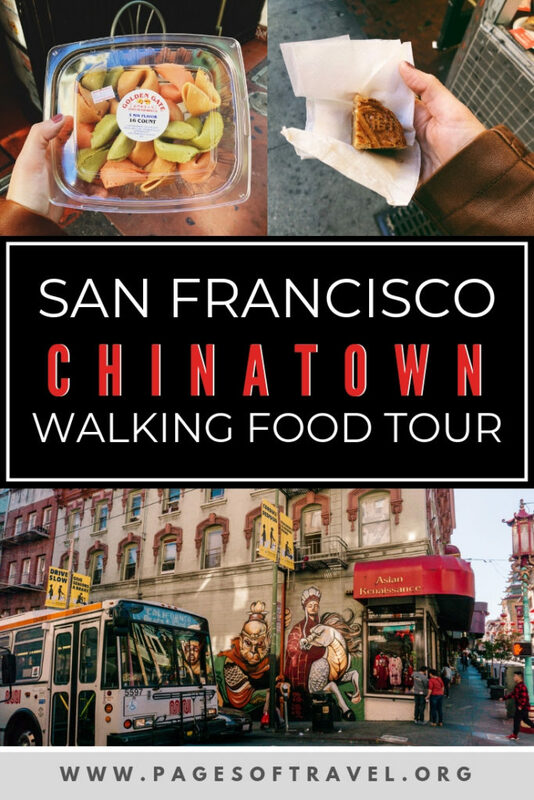 Lately I’ve become a huge fan of food tours so this San Francisco walking tour of Chinatown was right up my alley. 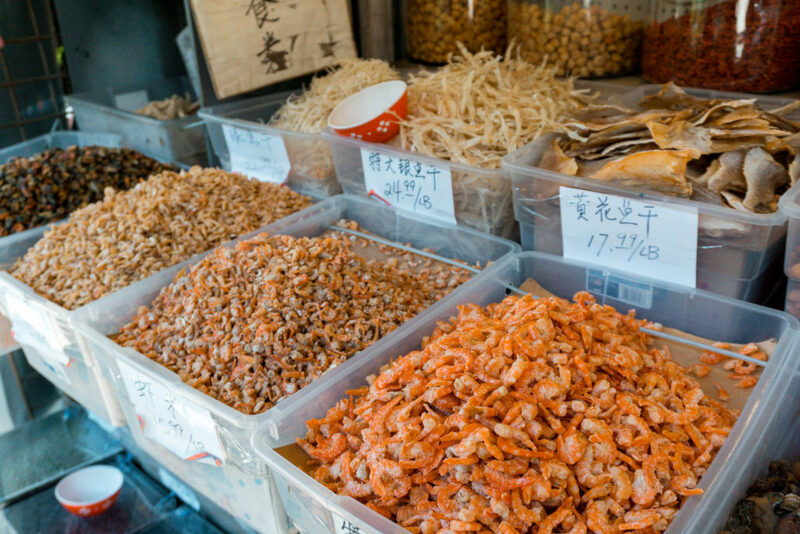 Food tours typically allow you to learn about the history of an area, learn more about the chefs, and find restaurants that you can return to and may not be as well known. 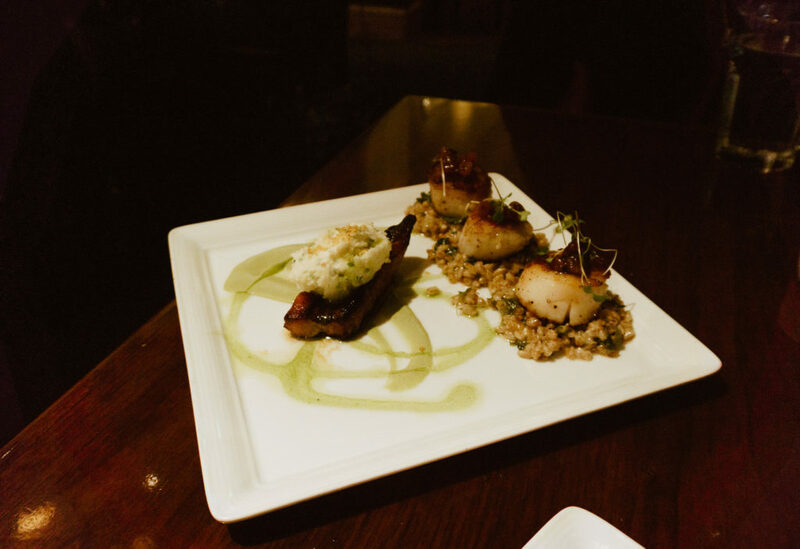 Not to mention you get to stuff your face with tons of tempting small plates and desserts! 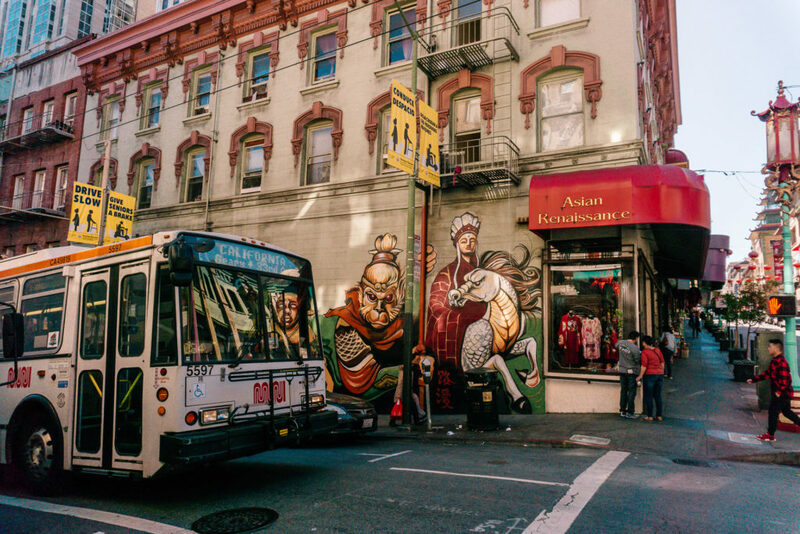 For this three-hour tour, you’ll see more than you ever could of Chinatown than if you did it from a bus or van. 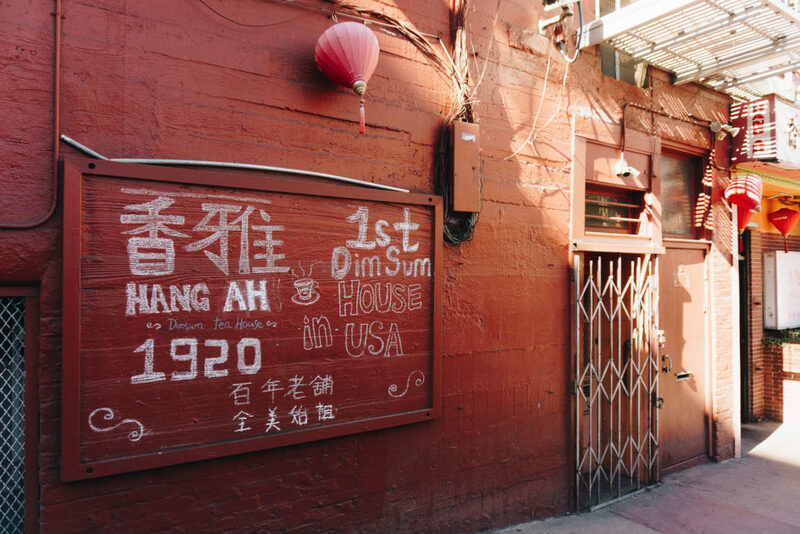 But first, a brief history of San Francisco’s Chinatown. 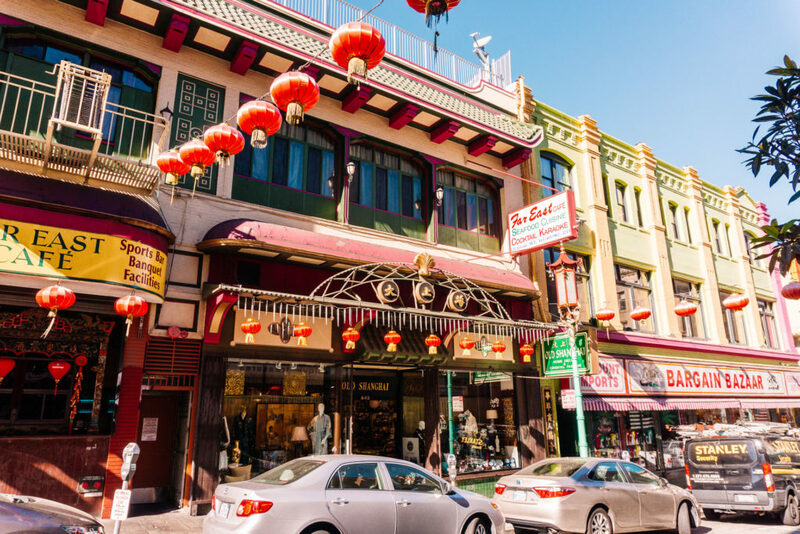 Chinatown San Francisco is the largest Chinatown outside of Asia and naturally is a top tourist attraction in San Francisco. It was first established in 1848 and continues to thrive as an enclave with its own customs, languages, worship establishments, and places of business. There are also many park spaces, two hospitals, a post office, and schools for those that live in Chinatown. 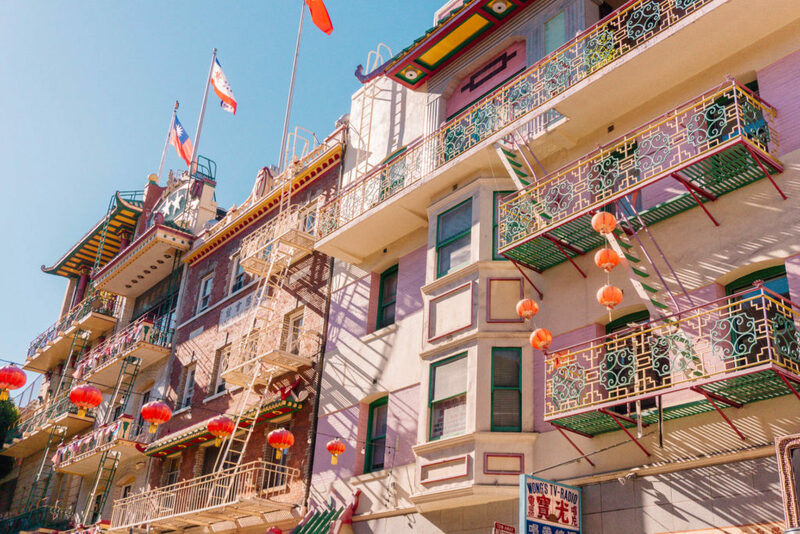 Due to the 1906 San Francisco earthquake and fire, the Chinatown neighborhood was completely destroyed thus began the process of rebuilding the area and you can now enjoy many buildings that are still standing after they were rebuilt, thus making this neighborhood extremely historic and unique. We started our food tour at the entrance Chinatown gate which was donated from Taiwan in 1970 and stopped by a few Chinese antique stores – I was personally mesmerized by the crystal chandeliers. From there went to St. Mary’s Square where many people practice Tai Chi in the park daily and arrived at the Old St. Mary’s Church which was the first Catholic church in California. 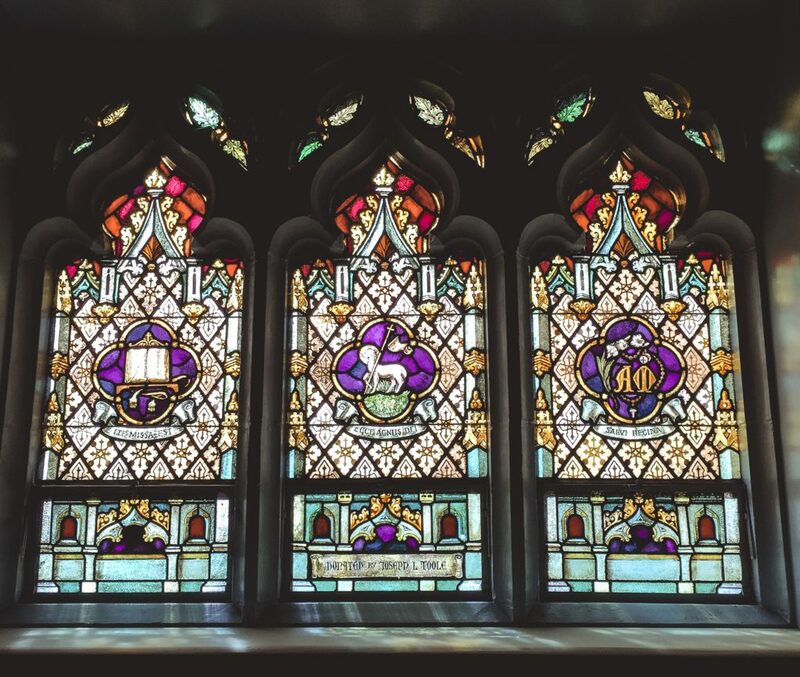 The inside of this church is absolutely stunning with historical details and beautiful stained glass so even if you decide to do a different tour I highly recommend visiting anyways! 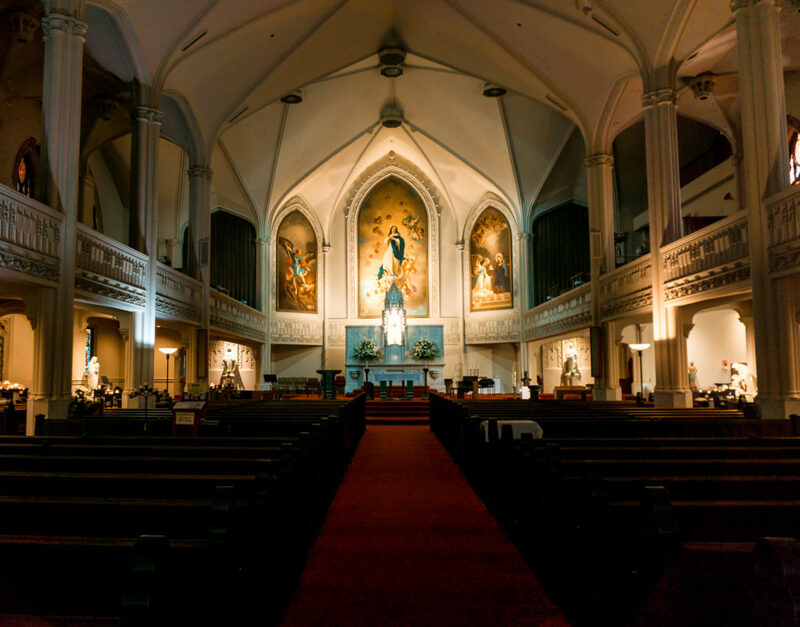 There is even a historical area inside the church where you can see photos of the church after the 1906 earthquake which it had originally survived but was gutted by the fires that were started the day after the earthquake. 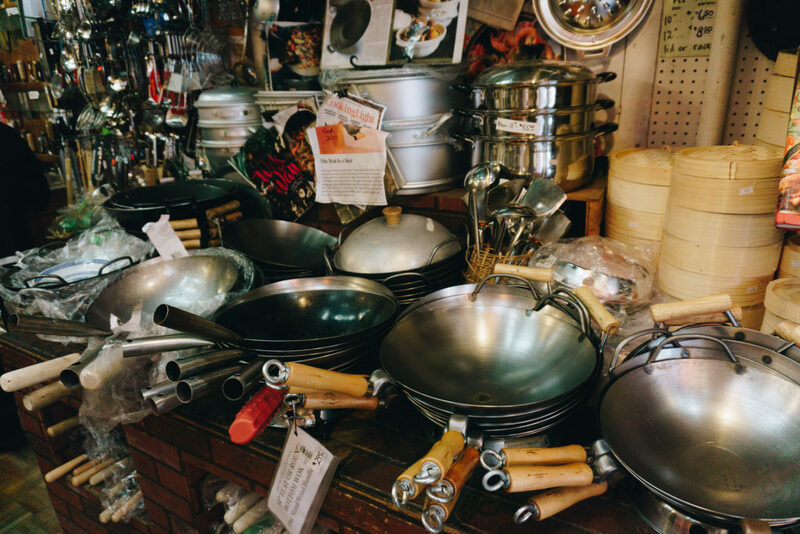 After visiting Old St. Mary’s Church we went to The Wok Shop, a kitchen supply shop that has been in business in San Francisco for over 48 years. If you are looking for a fun souvenir to take home or as a gift to someone from your time in San Francisco this is a great place to find something, especially if you enjoy cooking. If I had a bigger piece of luggage I might have went home with a wok and mooncake press myself! Right next to The Wok Shop is Eastern Bakery, the oldest bakery in Chinatown. The mooncakes here are so delicious and well-known they are even shipped to China to sell! Naturally, we sampled a mooncake with lotus seed paste and I’m pretty bummed that I didn’t buy at least 5 more on the spot (what was I thinking?!). 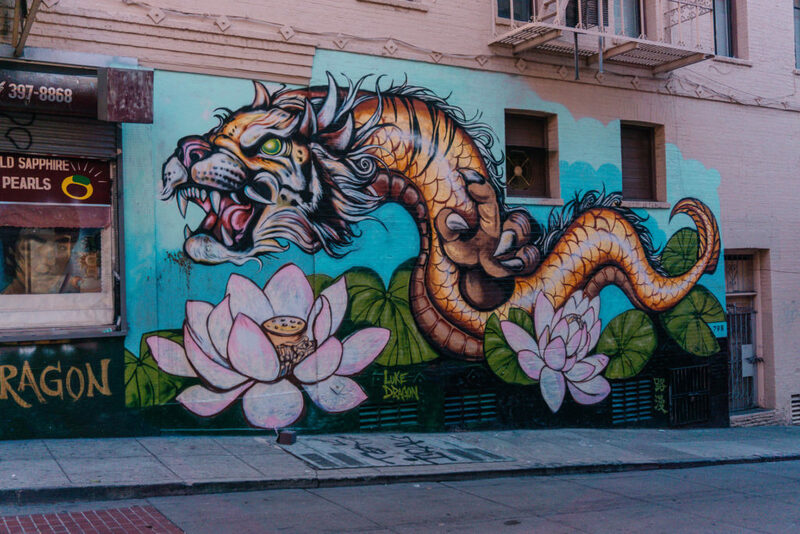 While on your San Francisco walking tour of Chinatown be sure to watch for all of the interesting street art, some of the coolest murals I’ve ever seen were in Chinatown. 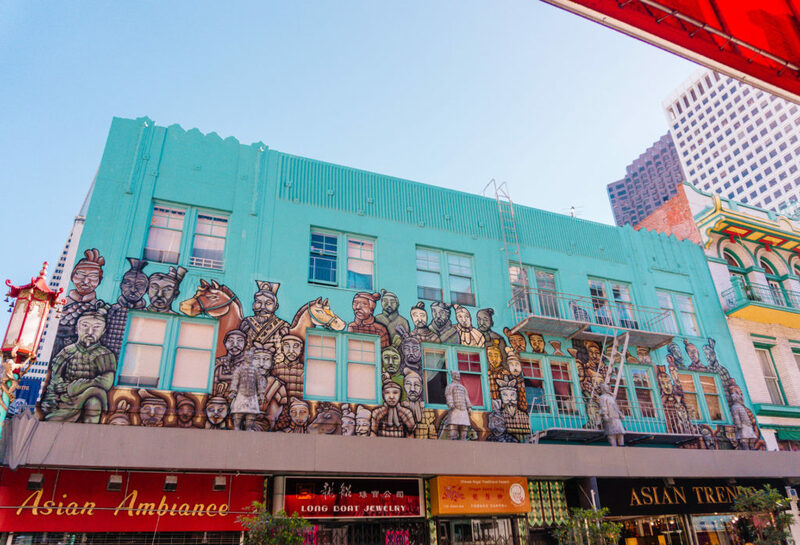 My favorite piece of street art in Chinatown San Francisco is the Terracotta Army Mural on the corner of Grant & Clay. The original Terracotta Army is a collection of sculptures that depict the armies of the first Emperor of China, Qin Shi Huang. It was a funeral ritual for the emperor to be buried with these statues for the purpose of protecting him in the afterlife. These statues were found in 1974 by farmers outside of Xi’an, China, though it is estimated that they date back to the late 3rd century BCE! So far over 8,000 army soldiers, 130 chariots with 520 horses, and 120 cavalry horses have been excavated and there could be more! A few of the statues from this collection have made the trip to museums around the world, but if you don’t have the ability to see them in person, this mural is pretty dang cool too. 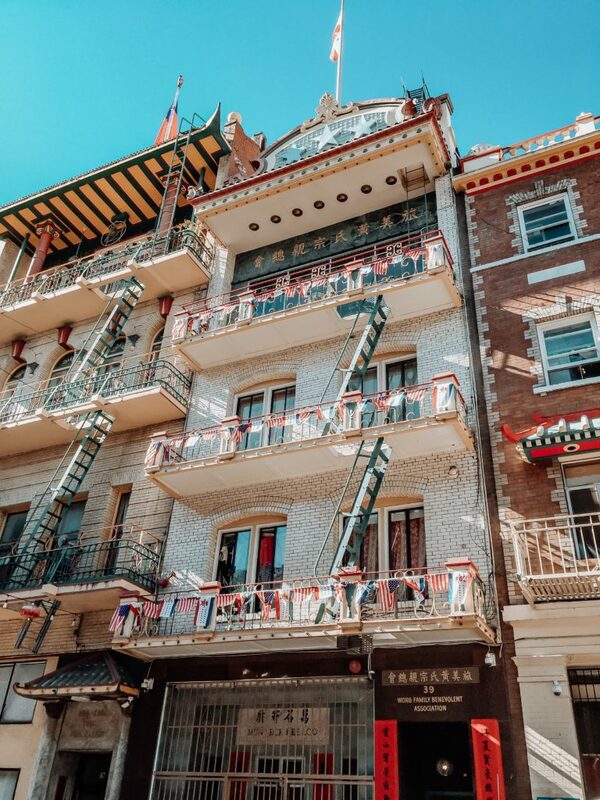 Next we stopped at Hang Ah Dim Sum Tea House which claims to be the first Dim Sum house in the United States (since 1920). 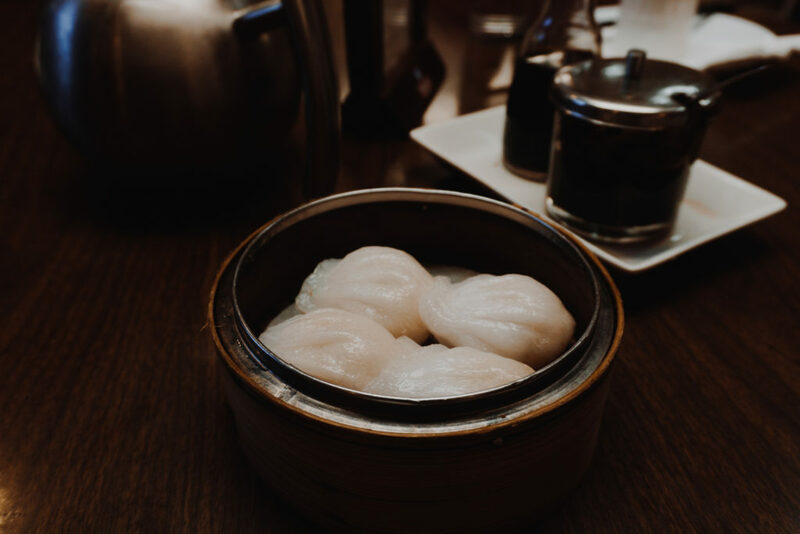 We tried their scallion pancake, shrimp dumplings, chicken pot stickers, and pork buns. I absolutely loved the scallion pancake which had a light flavor and was perfectly crispy. 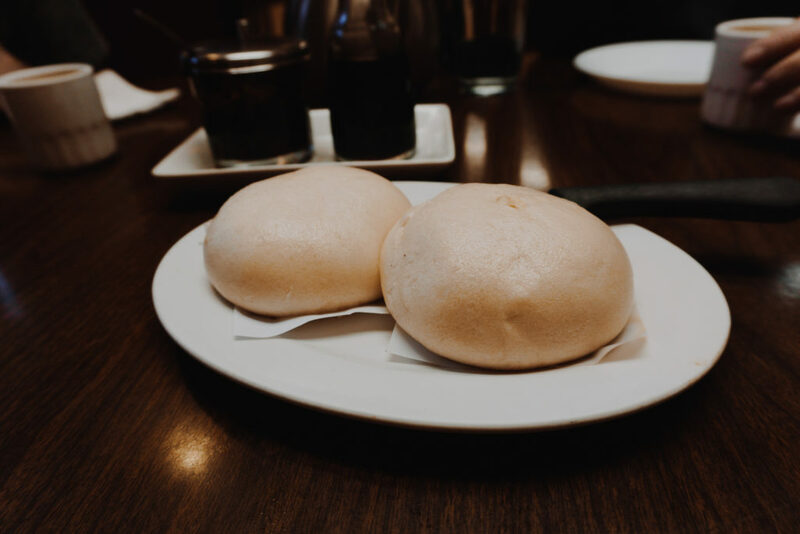 My mom’s favorite was the pork buns that were light and fluffy breading with barbecued shredded pork inside. We then visited a local Buddhist temple, which was on the fourth floor of an apartment building. We greatly enjoyed the beauty of this local temple and if you pay a small fee you can even participate in a traditional fortune reading and take home your paper fortune. Continuing with our sweet and savory pattern our next stop was iCafe Bakery. We originally were going to try some of their mochi but they were out so we each had an egg custard tart which was incredibly yummy! 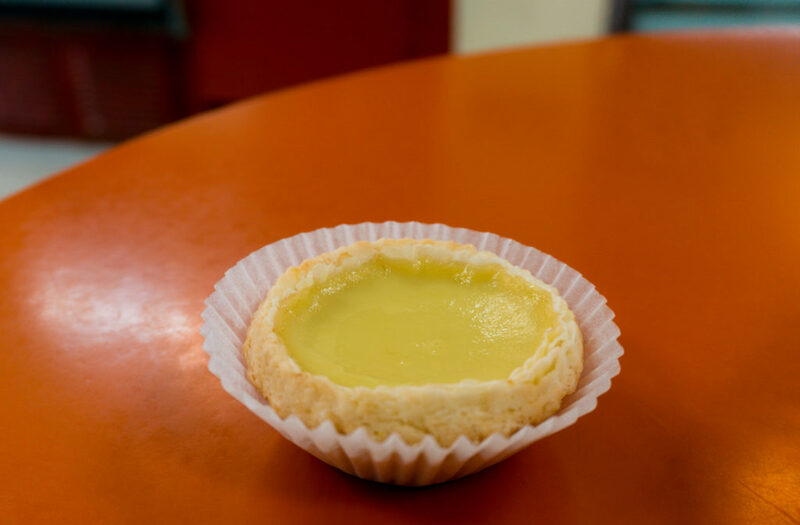 There are a few bakeries in Chinatown that specialize in egg custard tarts but our guide said this is her favorite. Considering the custard was delicately creamy and the pastry was perfectly flaky I can see why! After gorging on egg custard tarts we went to a few stores that sell traditional Chinese herbal medicines and a doctor’s clinic who specializes in herbal medicine and acupuncture. 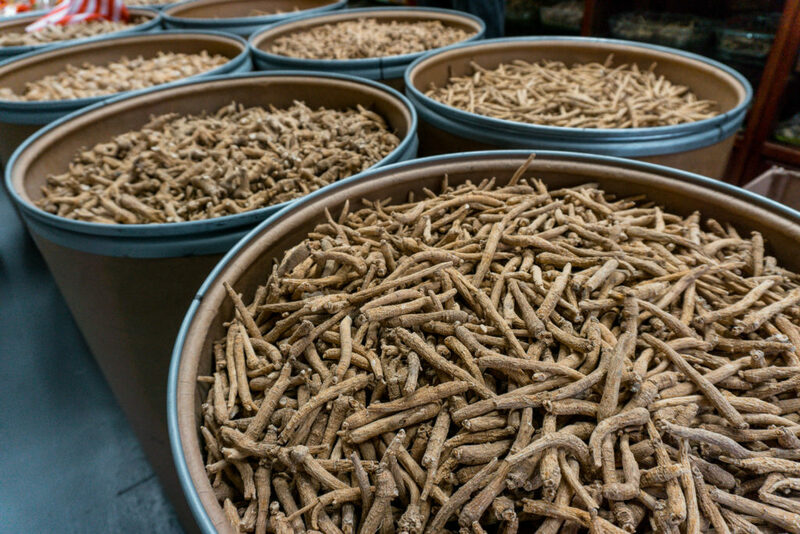 Traditionally, Chinese medicine focuses on ailments such as allergies, anxiety, arthritis, skin conditions, insomnia, menopause, and others. It also emphasizes individual treatment through acupuncture, acupressure, cupping therapy, herbal medicine, exercises such as tai chi or a change in diet or nutrition. 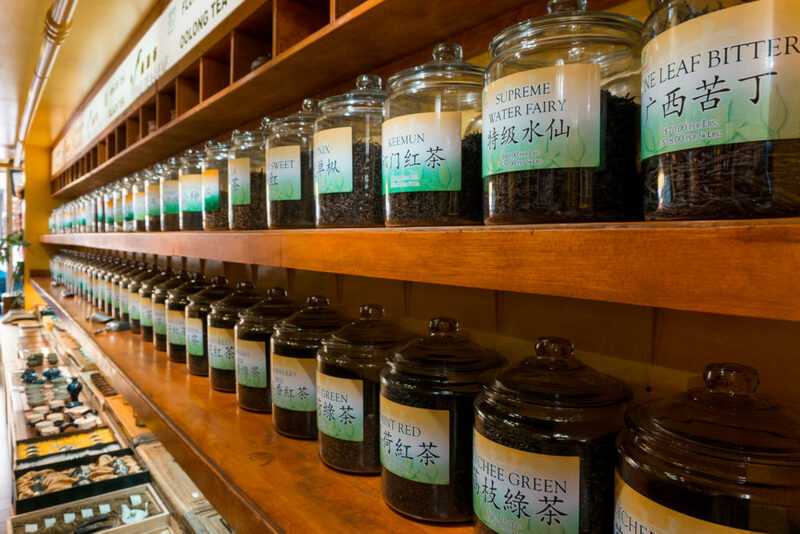 At the stores we visited for Chinese herbal medicine you could find a variety of common herbs and formulas used in traditional Chinese medicine. These items you can buy in small quantities or in bulk. 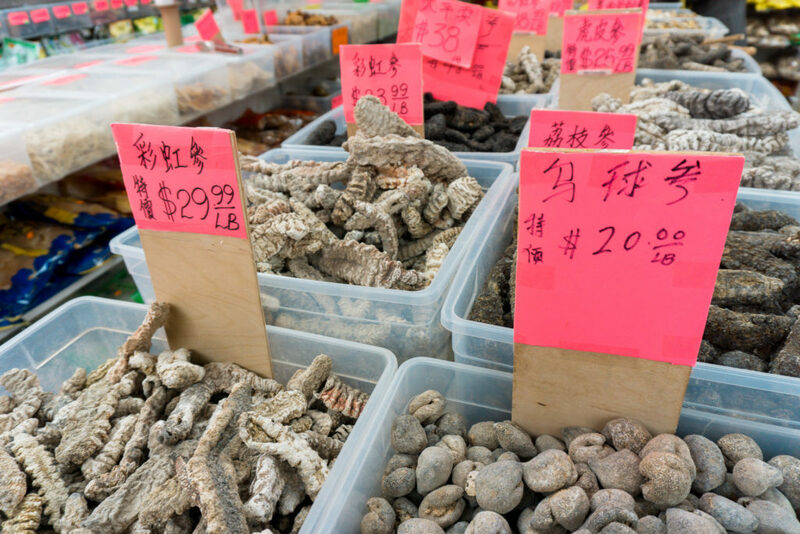 Ginger, ginseng, cinnamon, sea cucumbers, and ginkgo are just a few of the items you might find here. Nearby to the clinic is a food market where many buy their daily groceries. 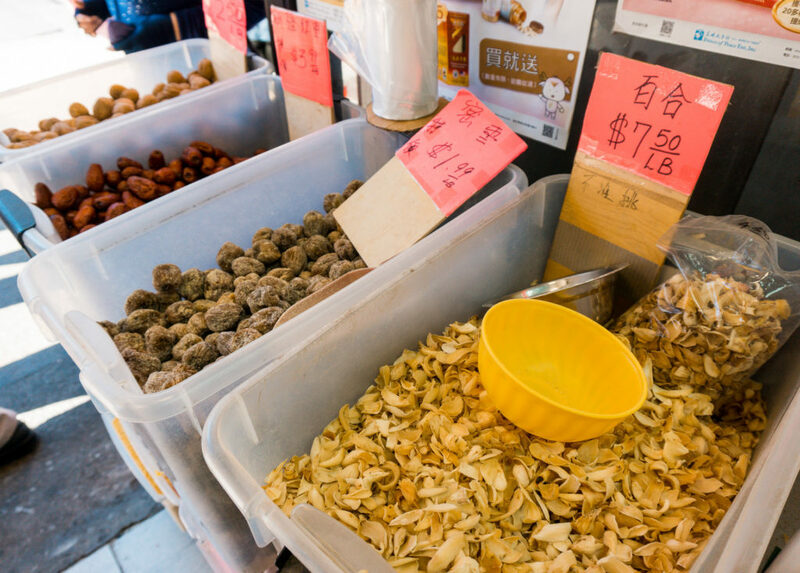 We learned from our guide that most people that live in Chinatown do daily grocery shopping because of the freshness of the items and the size of their living spaces, which are typically very small without much room to store items in bulk. It was interesting to see the cost of items and the various kinds of grocery items that were available for purchase. 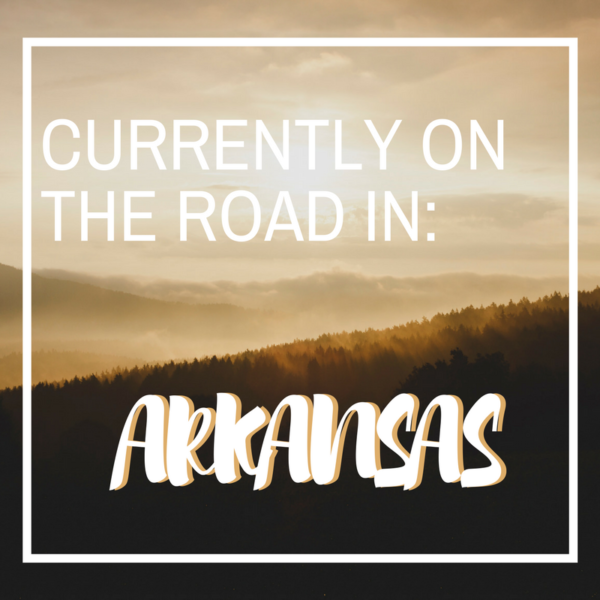 Living in a landlocked state had me wishing we had a place to buy fresh fish too! The next stop is definitely an iconic place to visit because it is home to the fortune cookie! 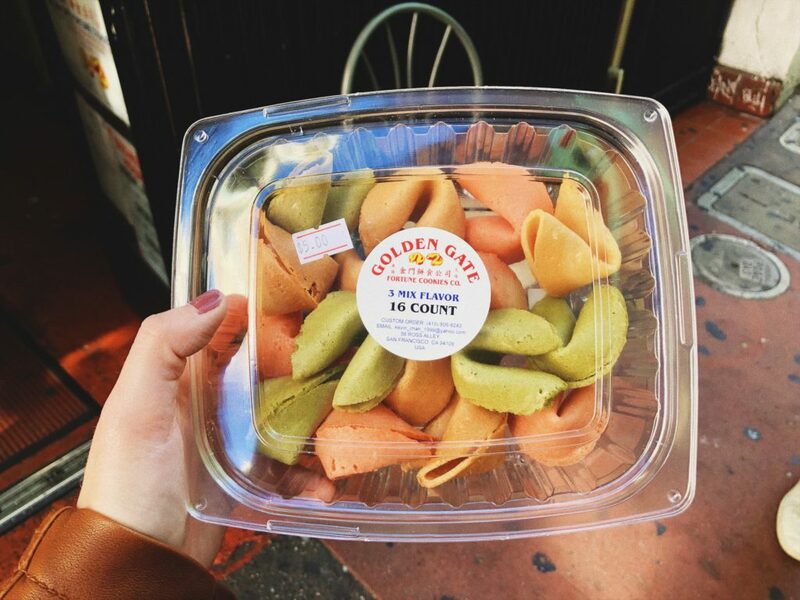 Golden Gate Fortune Cookie on Ross Alley makes, on average, around 10,000 fortune cookies a day! When we walked in we were immediately greeted by the enticing aroma of vanilla from the fortune cookies baking. We were allowed to sample some and even see them being made by hand! 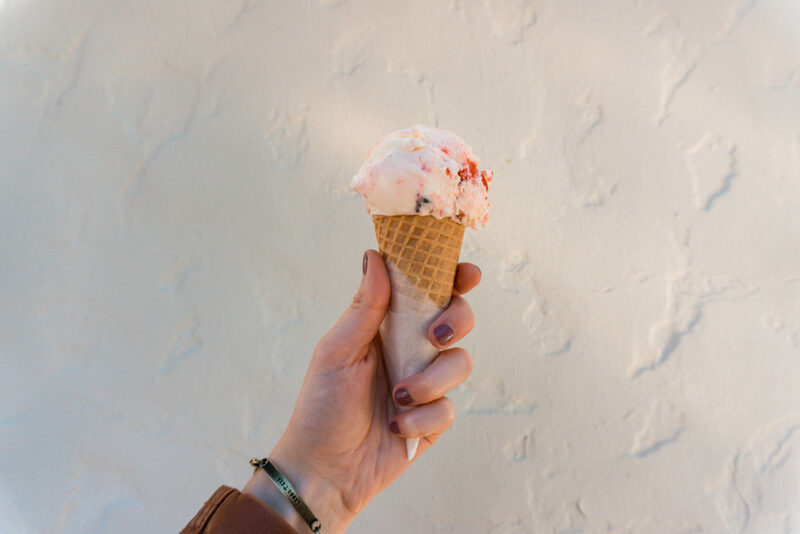 They are available for purchase in the factory and even have other flavors than the regular fortune cookie flavor such as chocolate, chocolate drizzled, matcha, and strawberry. 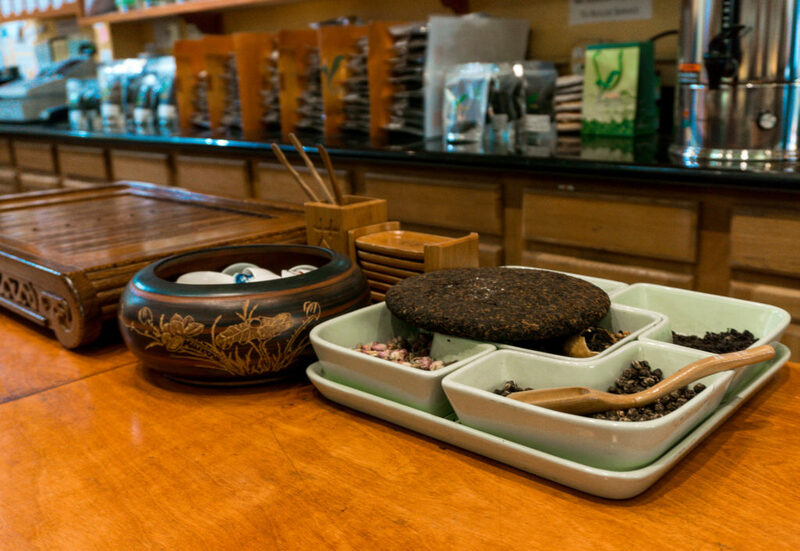 For years tea has been considered a “fountain of youth” promoting many various health benefits so for a relaxing stop on this San Francisco walking tour, we went to Vital Tea Leaf which has such a beautiful and cozy setting. 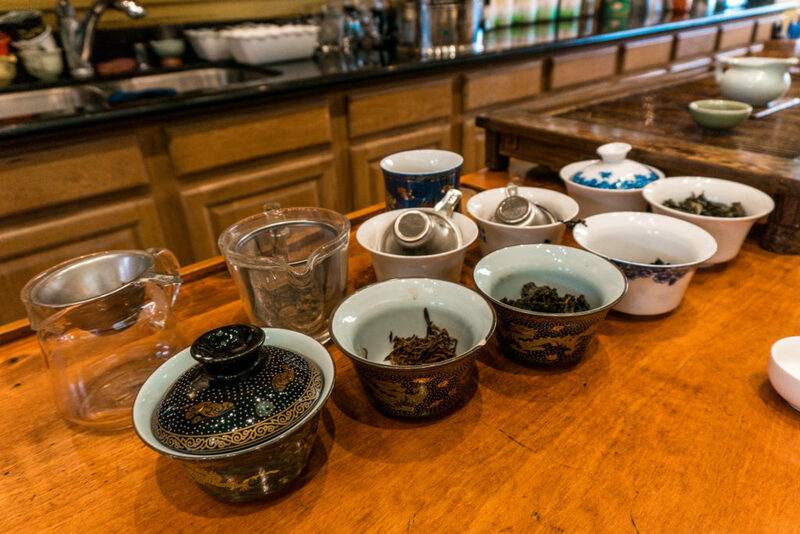 We tried many different teas from all over the world, and I’m definitely coming back to chill and sip some tea on a future trip. I bought one of my favorites, a blue tea back home with me. The last stop on our Chinatown walking food tour was Grant Place Restaurant. As if we hadn’t had enough to eat today, we feasted on steamed sesame balls (which you can tell went fast! 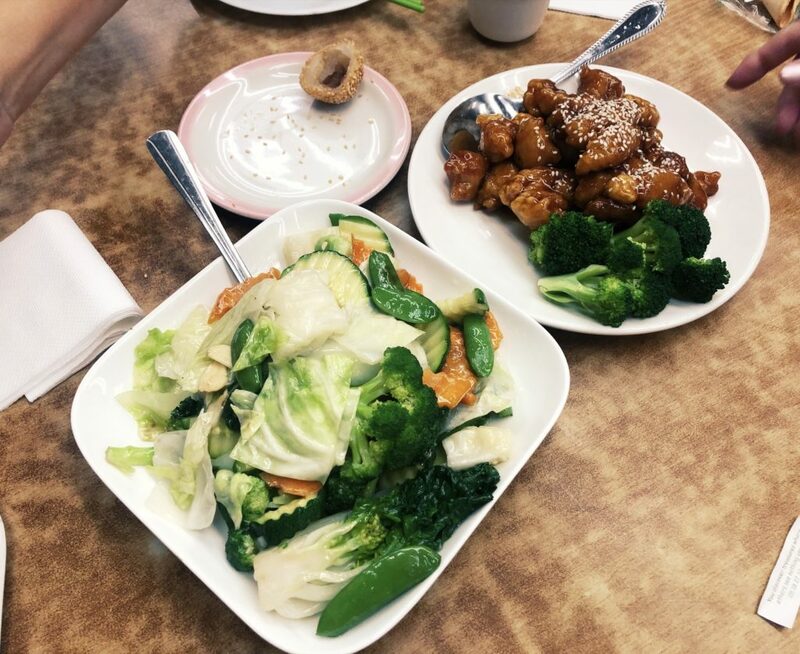 ), traditional sesame chicken, and mixed steamed veggies. After eating, we sipped on more hot tea to finish it off. One thing’s for sure, you won’t go hungry! One of the things I personally enjoyed about this tour is that our guide was able to order items based on any dietary restrictions or food allergies (just let them know ahead of time when you book your tour). As someone who does not eat red meat and has food allergies, it was important to me to have such accommodations and the tour company was happy to do so. 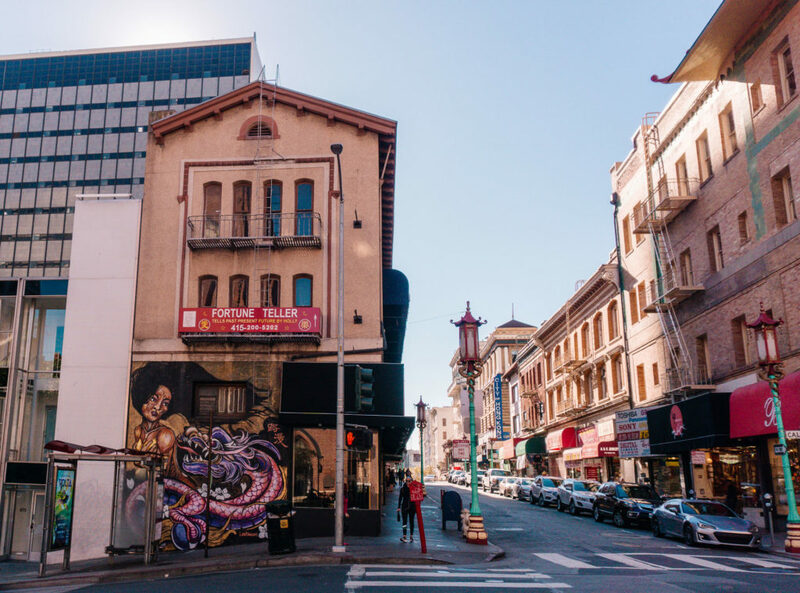 Our guide, Cynthia was extremely knowledgeable about the history of Chinatown and shared more experiences with us that I can’t even do it justice in this article. I’ve done a number of food tours but this one definitely stands out as one of my favorites. In fact, when I return to San Francisco, I want to try their North Beach food tour next. For the sake of honesty and transparency, I am not usually a tour person, or at least prior to these, I didn’t think I was. But the reason I am recommending these San Francisco tours is that I genuinely enjoyed them! Each tour was smaller and more intimate rather than a tour with 40+ people! Running the numbers, on the VW Bus Tour there were only six of us including our guide and we were able to see more of the city in the small VW van versus a large tour bus, our Napa Valley and Sonoma Winery tour had around 20-25 people, and our San Francisco walking tour of Chinatown had only 4 people including our guide. 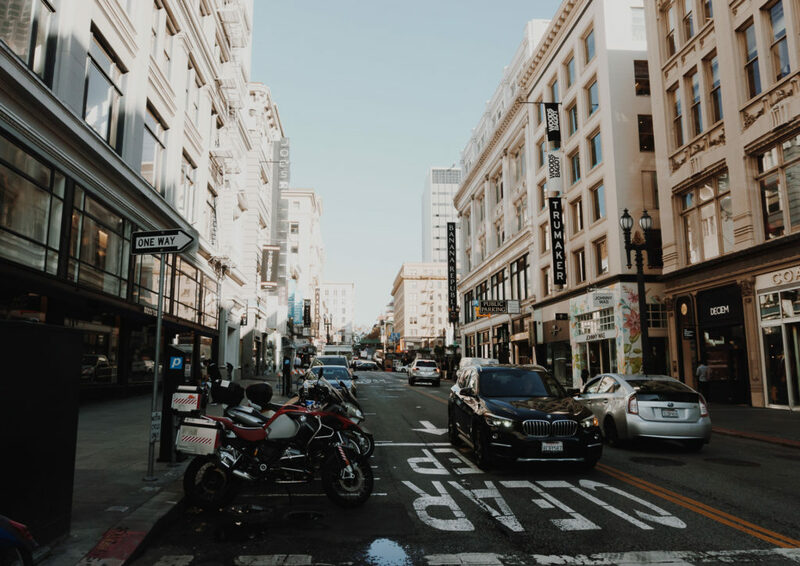 Since we were on a number of tours from San Francisco we were able to see many different places but there are a few additional recommendations for things to do, places to eat, and where to stay in San Francisco. 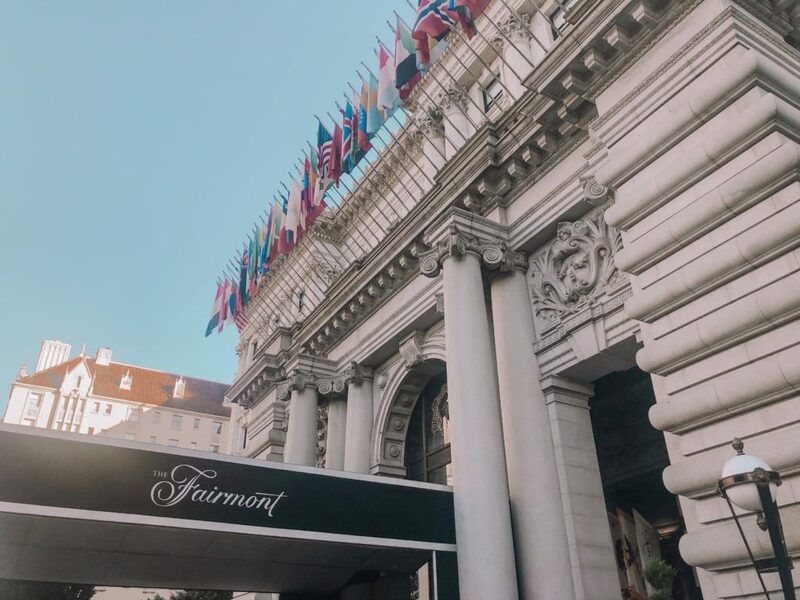 When thinking of iconic places in San Francisco, one can’t help but think of the stunning and historic Fairmont San Francisco. 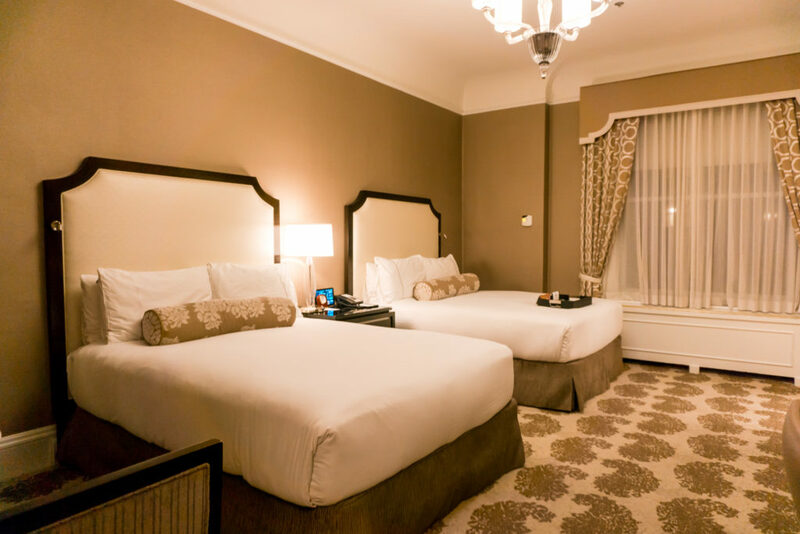 This AAA Four-Diamond luxury hotel has been the scene for numerous movies, celebrities, and is on the National Register of Historic Places. 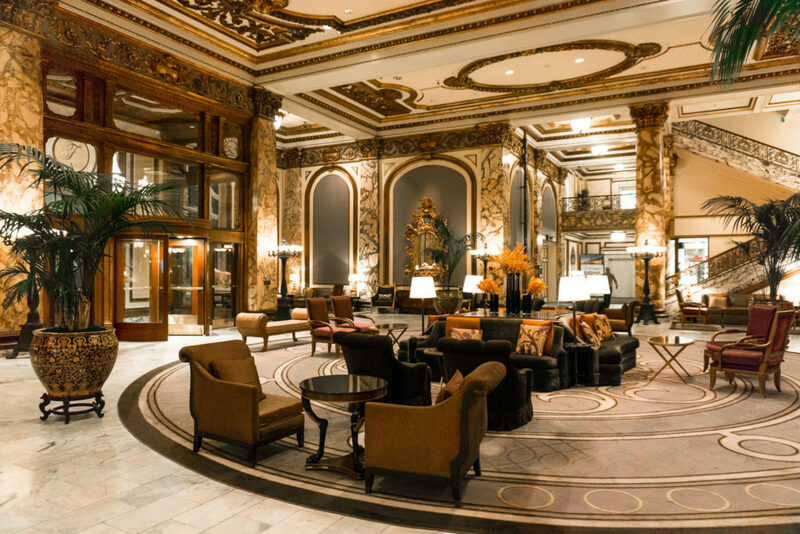 We loved our stay at this historic and centrally located hotel in San Francisco. 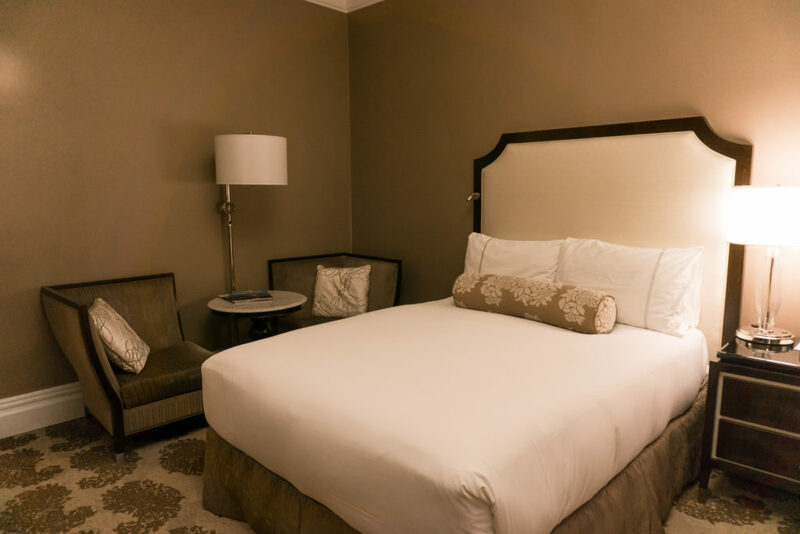 Each of the 606 rooms and suites is lavishly decorated as is the hotel grounds itself. 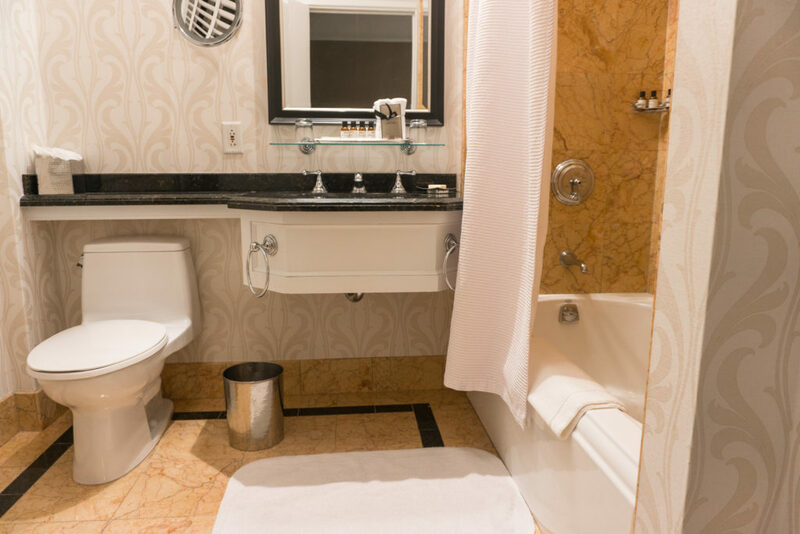 If you get the chance, stop by the The Venetian Room where Tony Bennett first sang “I Left My Heart in San Francisco” and witness the giant Gingerbread House being built in November for the holidays, the smell of the gingerbread is enough to make you want to stay! Eight AM is a small cafe with a compact setting and relatively plain decor but the service and food are definitely something to write home about. I personally liked the menu variety and the ability to customize your entrees such as choosing two bagel fix-ups and avocado toast three ways. 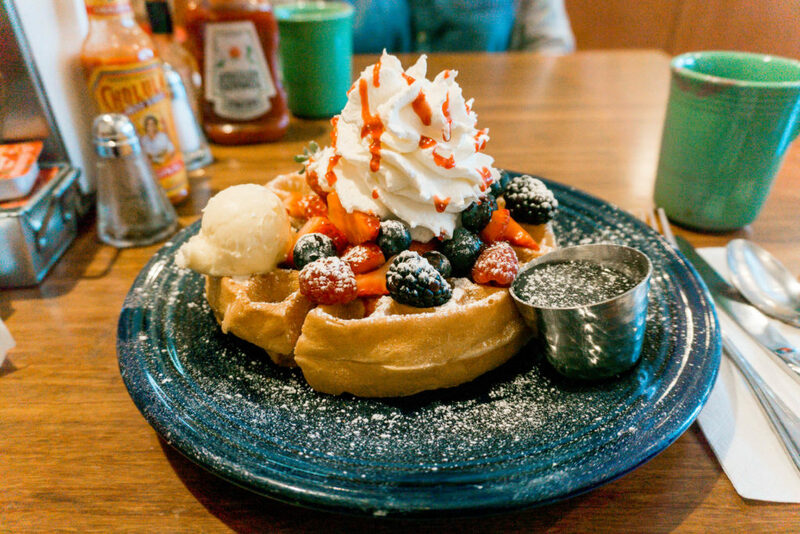 I was craving a sweet breakfast this morning and chose to order their fresh berries waffle which was dang delicious – now I want to go back to try that avocado toast! Focaccia Market and Bakery seemed like a popular salad and sandwich shop for locals. We hit this particular location right during the rush hour lunchtime but were quickly served. If you are looking for a fast meal they offer ready-to-go salads and sandwiches in their coolers. 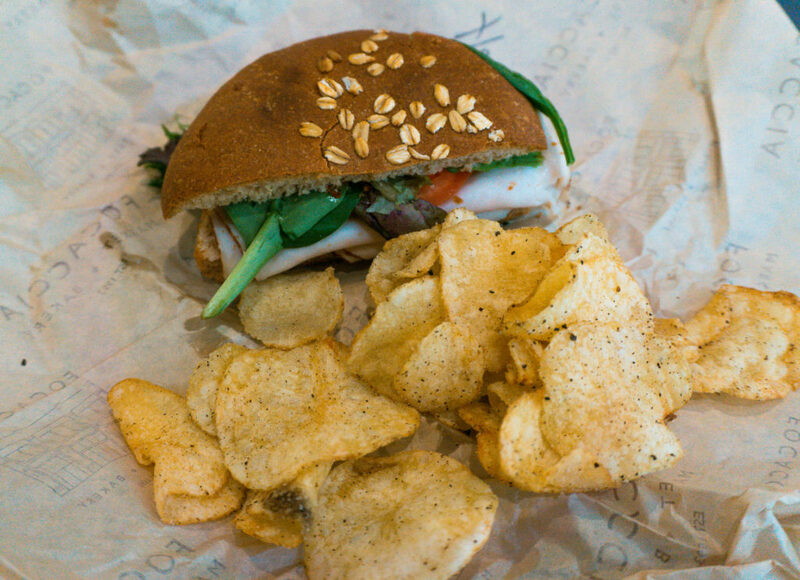 But if you’ve got a little more time I suggest hopping in line for a build-your-own sandwich or salad. For the sandwich bar, you can choose your bread, cheese, sauces, and any meats or veggies you’d like to add on. Similarly, for the salad bar, you can choose your type of lettuce, toppings, and dressing. Bistro Boudin is located in the heart of Fisherman’s Wharf and offers a stunning view of San Francisco Bay. 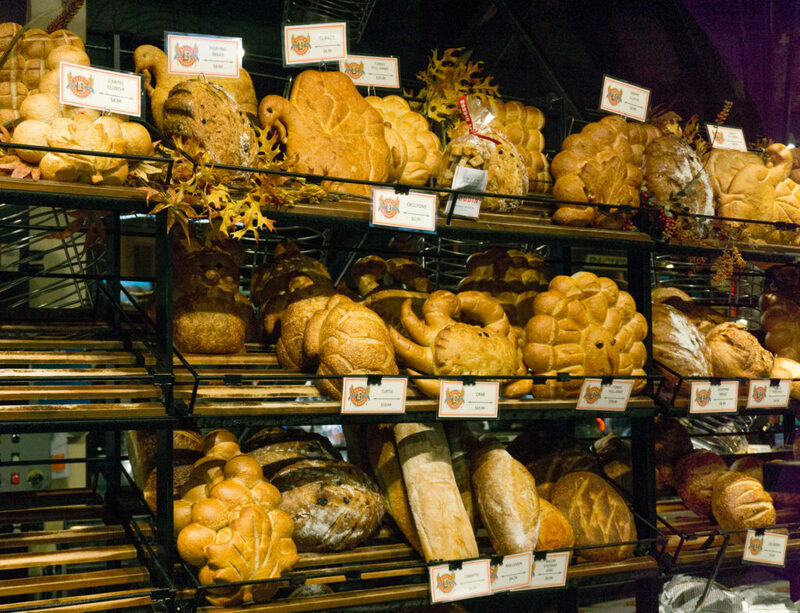 Their bakery, located on the first floor of the restaurant, offers to-go menu items which are perfect for lunch options and sells its legendary, fresh sourdough bread and amazing clam chowder (even by the can so take some home!). 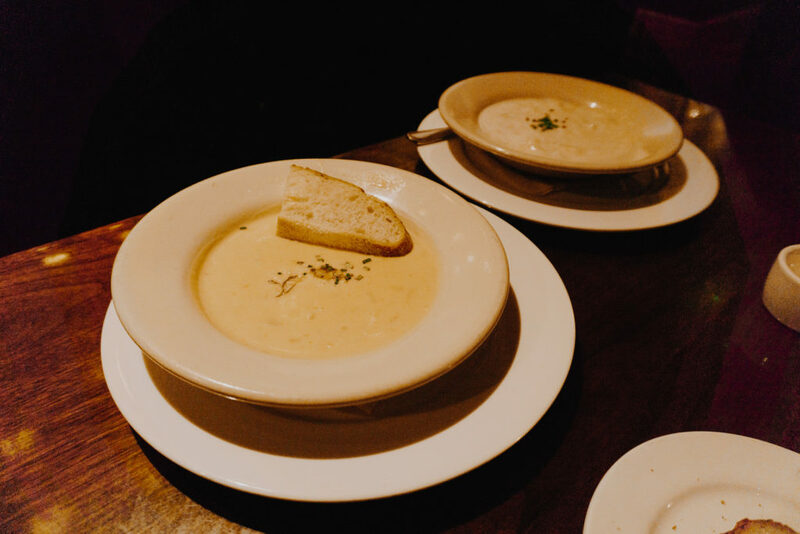 For starters, my mom and I shared their clam chowder and crab & corn bisque then indulged on their pan seared scallops which were topped with pineapple chutney and served with braised farro and whipped potatoes. I’m not sure if Venticello Ristorante is a highly well-known San Francisco restaurant but someone recommended this place and we really enjoyed everything about it. 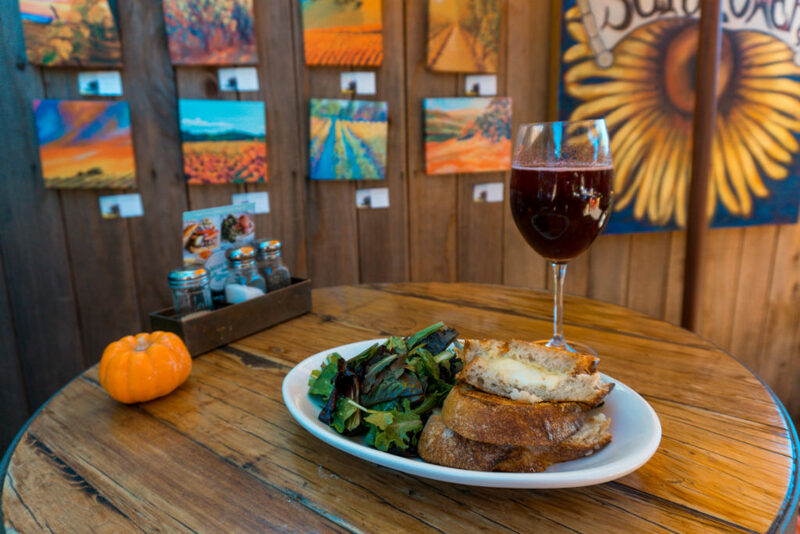 This tiny family-owned restaurant is tucked away on Nob Hill walking distance from the Fairmont San Francisco. You can enjoy a glass of wine while gazing on the view of the cable car coming by and smelling the wood-burning oven. The menu at Venticello is small but specialized. 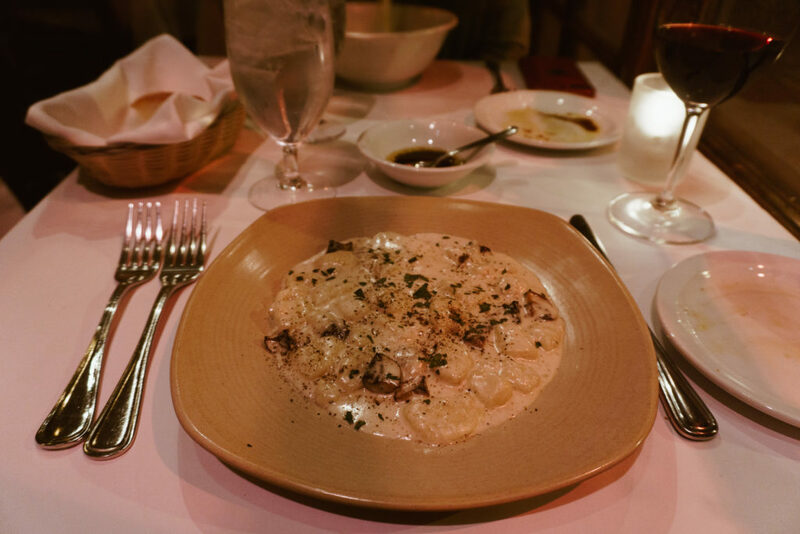 I opted for their homemade gnocchi with gorgonzola and mushroom cream sauce. 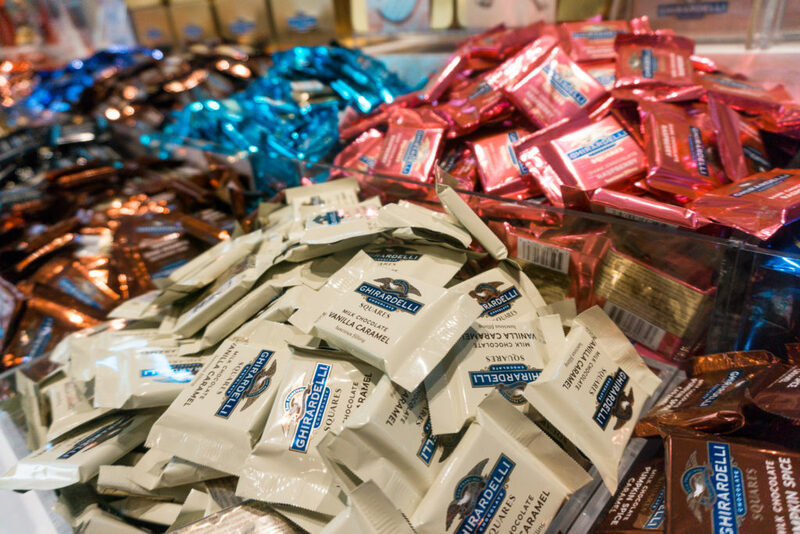 There are a few different Ghirardelli Chocolate & Ice Cream shops in San Francisco but he one at Ghirardelli Square is the original. 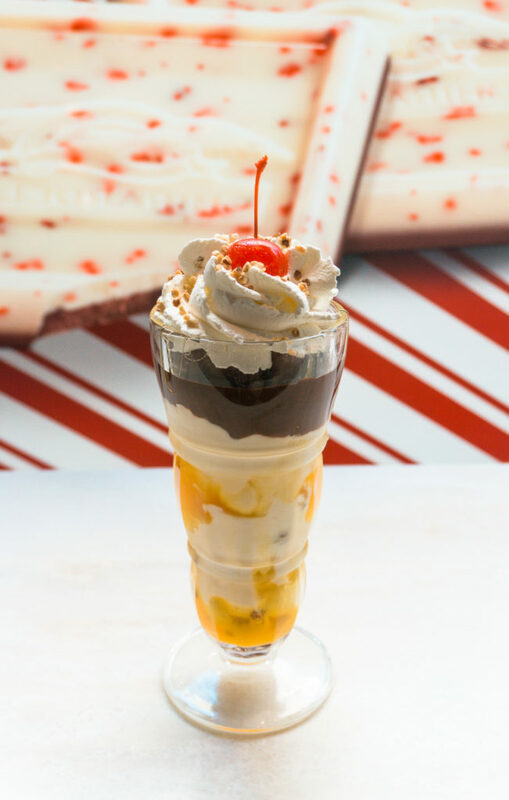 Obviously you should buy some chocolates to take home but while you’re in the shop also try one of their delicious sundaes! All of the sundaes have fun San Francisco specific names, and I couldn’t resist trying the Strike It Rich, a butterscotch hot fudge sundae with butter pecan and vanilla ice cream, diced almonds, and handmade hot fudge – so yummy and big enough to share! 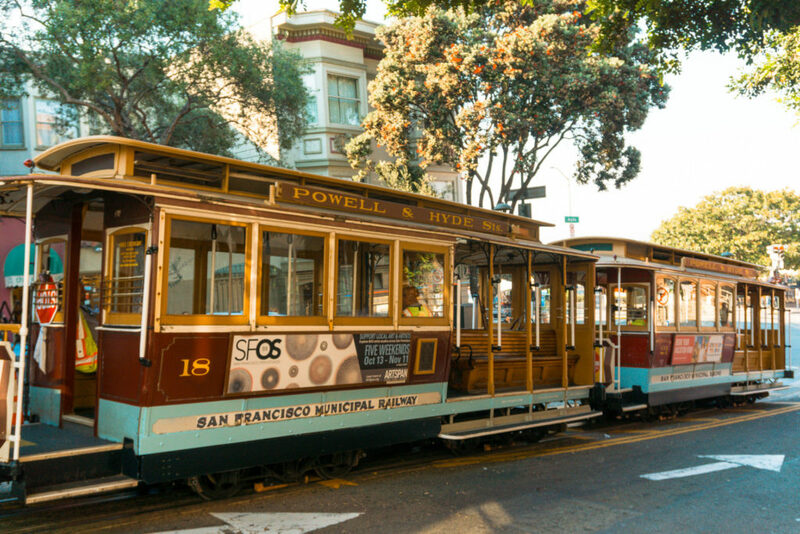 The San Francisco cable car system was built in 1873 and it is the last manually operated cable car system in the world. 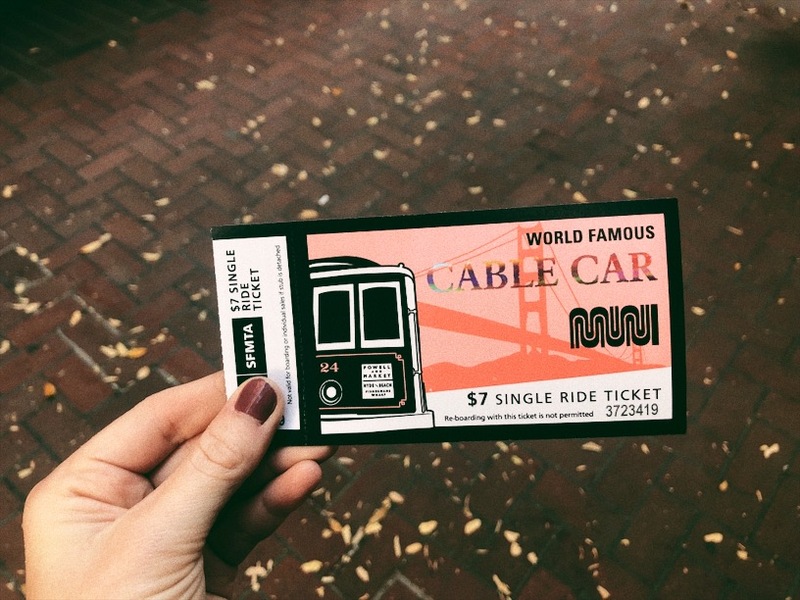 Out of the original 23 cable car lines, only three are still running – Union Square, Fisherman’s Wharf, and California Street. Needless to say, this is a must do at least once while you’re in San Francisco. We hopped on the stop at Union Square and took the cable car all the way to Fisherman’s Wharf. I briefly mentioned the Fisherman’s Wharf area in the VW Bus Tour but this is one of the most popular tourist areas in San Francisco. There are a number of souvenir shops, seafood restaurants (like Bistro Boudin! ), and a plethora of sea lions that lay sunbathing by the docks. If you want a good view of Alcatraz this is great spot to look over the bay or join an Alcatraz tour! 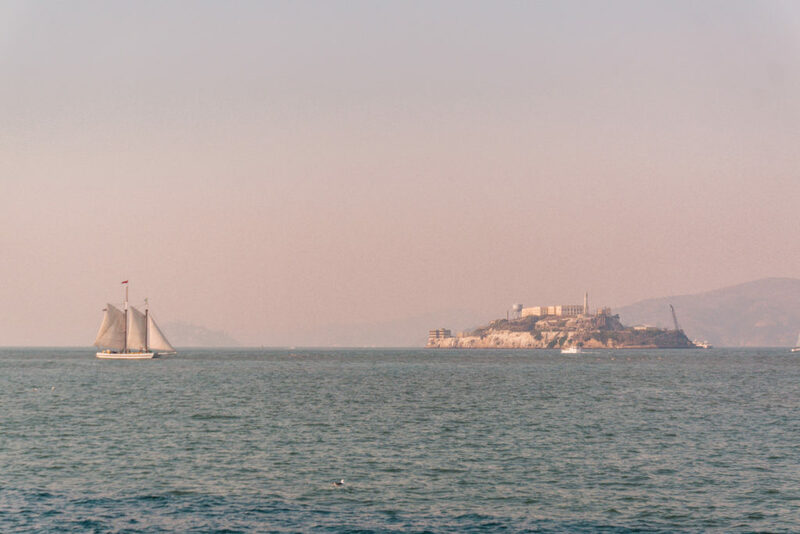 Alcatraz Island was where some of the most notorious criminals in America were once held in prison, which operated from 1934-1963. Some of the most famous inmates were Al Capone (“Scarface”), Robert Stroud (“Birdman”). But there is more to the history of this island than just the prison. 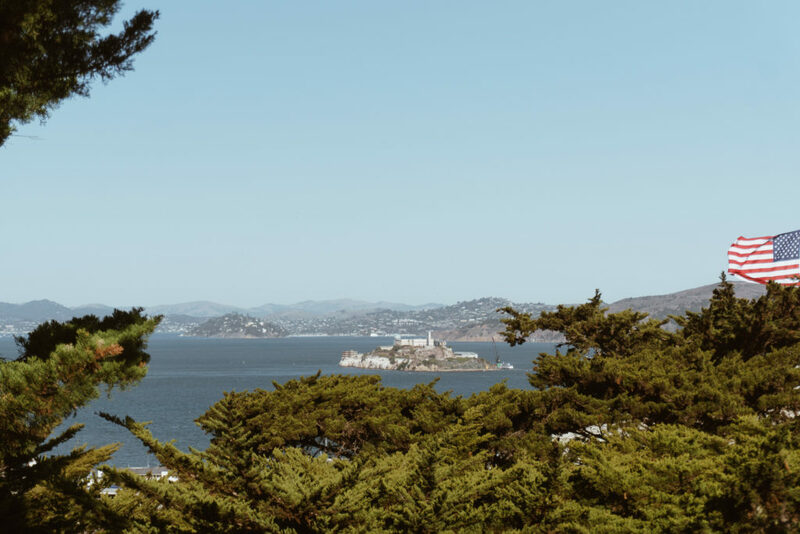 Unfortunately, we didn’t have time to visit Alcatraz Island on this trip but there are a number of Alcatraz tours that you can take. The tours often include a round-trip ferry to and from the island and a tour while on the island either by a personal guide or audio guide. There are even night tours to go on if you dare! 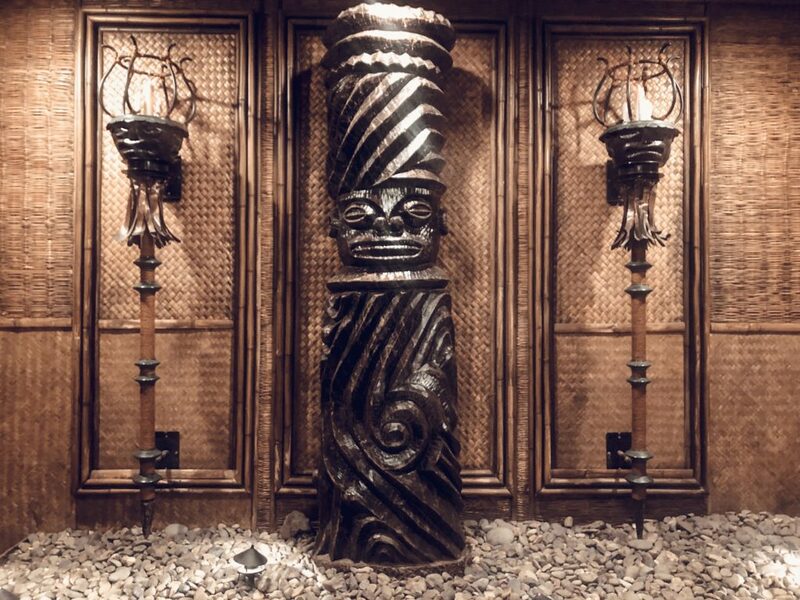 The Tonga Room is located in the Fairmont Hotel and while it might initially seem like a cliche tiki bar, let’s rewind a few years. The setting of this popular restaurant was once a 75-foot indoor swimming pool known as the “Fairmont Plunge.” The elaborate design of this pool brought many interested guests including Ronald Reagan and Helen Hayes. In 1945 the Fairmont Plunge turned into the Tonga Room and the pool became a lagoon for a floating stage with an orchestra band. Anthony Bourdain once said that the Tonga Room was “…the greatest place in the history of the world.” If anything, come grab a Mai Tai and some happy hour appetizers while enjoying the sound of tropical rain that falls from the ceiling a few times each hour. 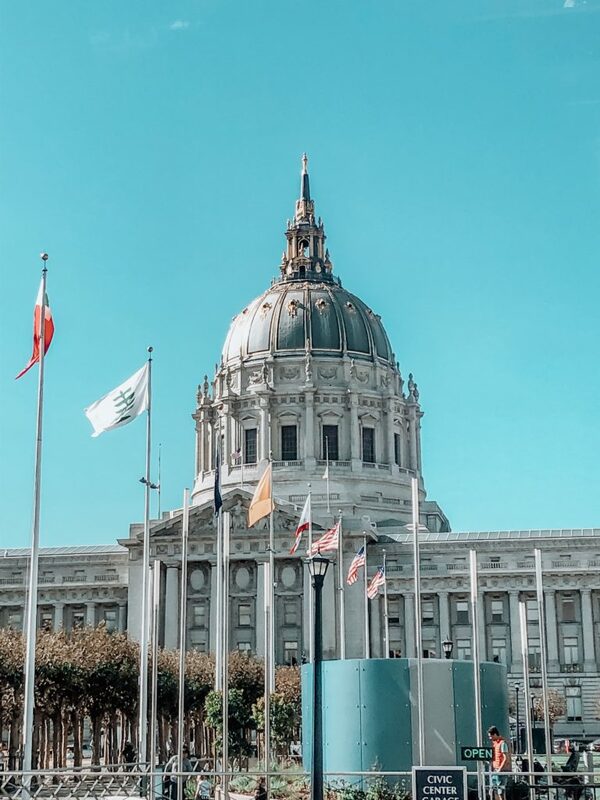 If you are looking for other things to do in San Francisco, tours from San Francisco or San Francisco walking tours here are some additional ah-mazing resources! 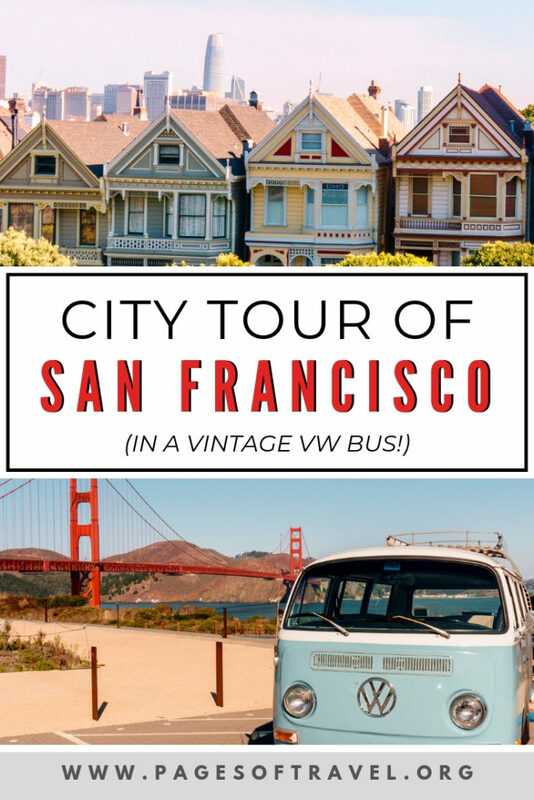 The Ultimate San Francisco Walking Tour – plus a free printable! My mom and I did part of this walking tour while we were in San Francisco and it allowed us to see the parts of San Francisco that we only saw briefly before. Since Logan still hasn’t been to San Francisco when we go together we’re defintiely doing the whole thing! 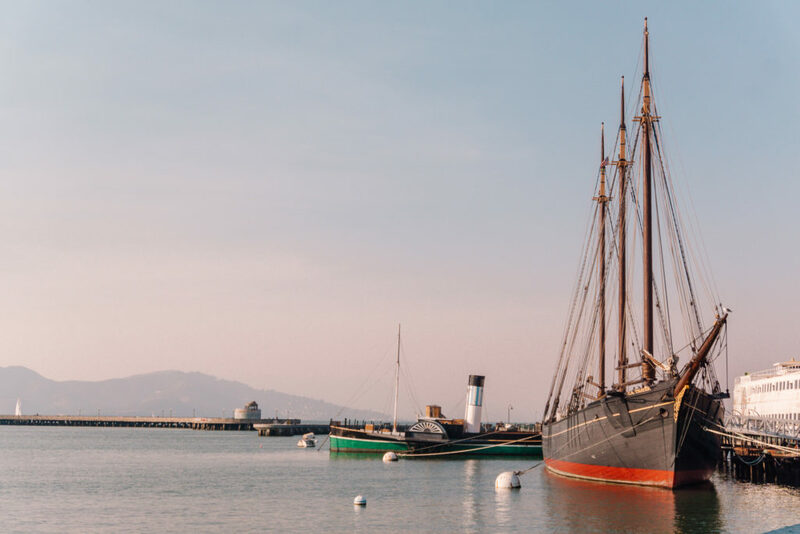 Day Trips from San Francisco – If you are looking for additional day trips from San Francisco, you’re sure to find something on this list of 30+ options! I can tell you right now that Sausalito is high on my list. 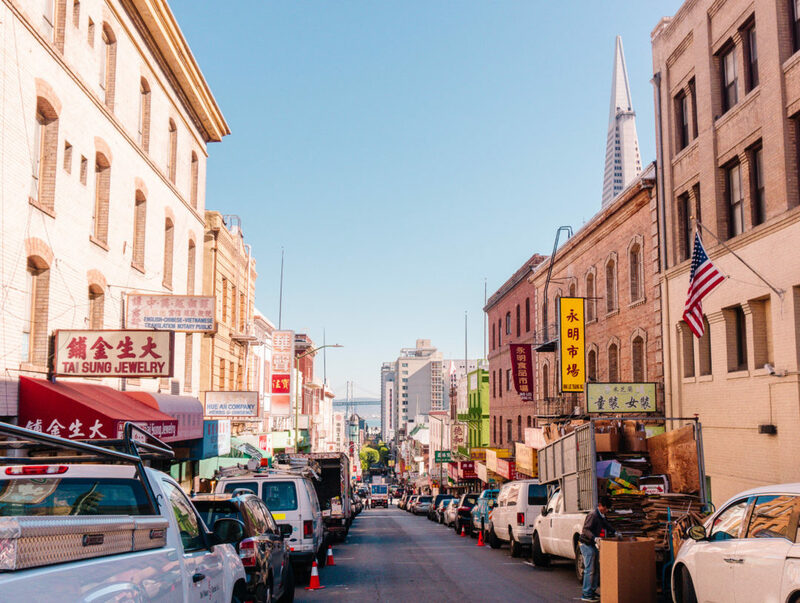 San Francisco Bucket List for First-Timers – A huge list of fun things to do in San Francisco from a local’s perspective. I want to try ALLLLLL of the restaurants mentioned here. 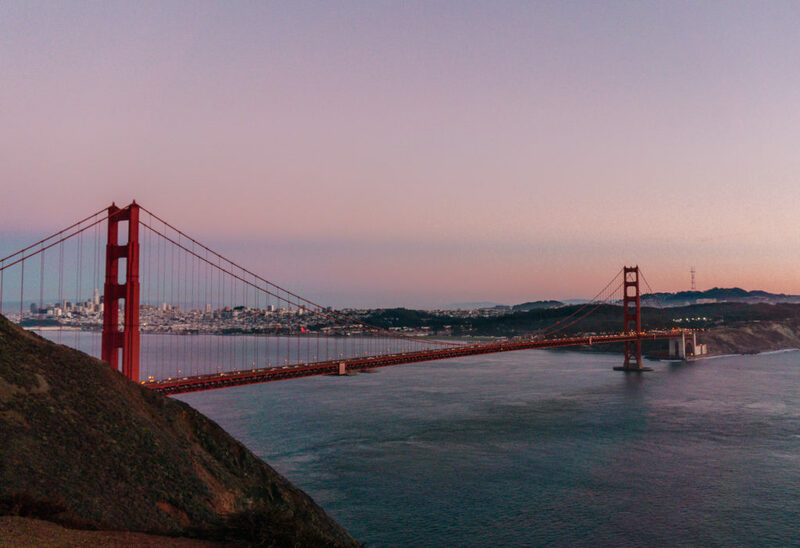 The Best Views of the Golden Gate Bridge – I was able to see two different epic Golden Gate Bridge viewing points but this list is ultimate goals! I know where I’m going for some photos next time. Which of these San Francisco tours would you be interested in most? Like this post? 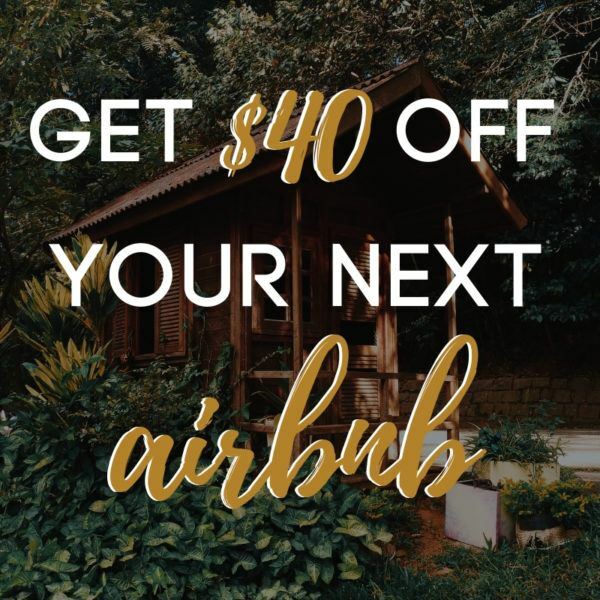 Click and save on Pinterest! 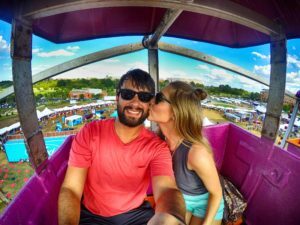 Love love love the idea of the VW bus tour! San Fran is high on my list to visit. Bridge, Alcatraz, cable cars… can’t wait!